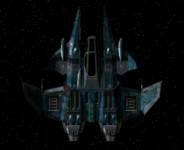 Rick Salemi found a couple of news clips from the Sci-Fi Channel's weekly newsletter that include commentary from Privateer 2's Clive Owen. 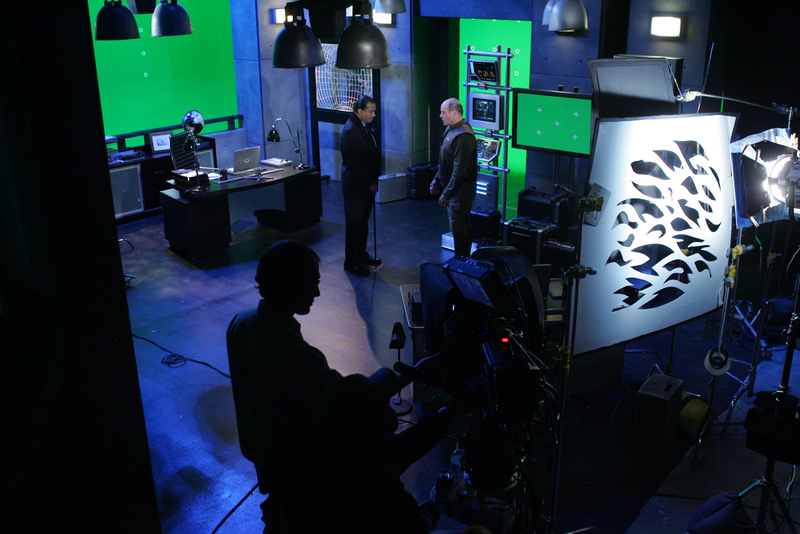 Although he was lucky to have a variety of real sets to work with during the P2 shoot, the experience was one of the first where he interacted with a wide range of special effect elements during filming. Since then, he's gotten quite a bit of practice in movies like Sin City and Children of Men. You can read about his feelings on green screen photography below. The full news clips are available here (half way down). Computer imagery was used to create the futuristic world. Owen said that acting becomes more complicated when working with backgrounds that need to be added in later. "We'd have to rehearse for a very, very long time, and it was very painstaking and specific," he said. "But then when we came to shoot it, it had to feel like we were catching it on the run. You have to feel like you're in the thick of it, and it's all about pacing. If you hold a beat a bit too long, it will suddenly feel a bit manipulative, like he's held there until we see the tank just over his right shoulder or whatever. So we worked very, very specifically about what we wanted to see and what we wanted to catch, and [when] we went for it we had to shake that up and keep energy that was much looser than that. They're very adrenalized, those sequences, because they're hugely set. Some of those bigger ones are four- and five-hour resets to try and go again for a take like that. ... I think that, technically, some of this film is pretty staggering." Make sure you also check out the P2 screenshot on the right. The Tri-System backstory depicted there is displayed during the game's initial installation. This is a reminder that our annual Fan Project & Web Site of the Year contest begins soon. 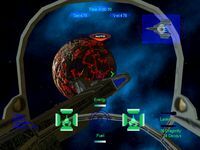 Email vote@wcnews.com to recommend the Wing Commander web sites, game mods or original projects that helped make 2006 a great year for fans. You can find a list of the past winners here. ...next’ll blow through the cockpit into the reactor. 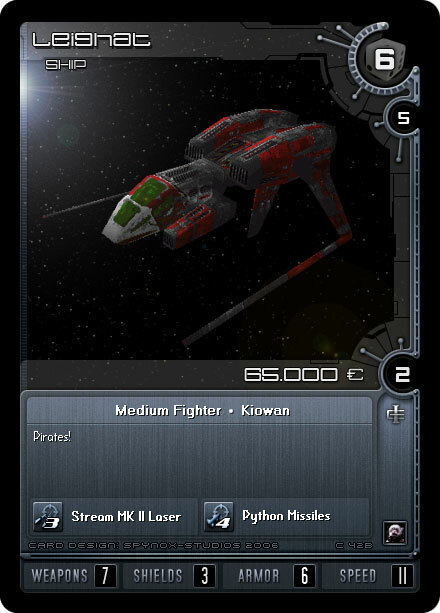 It's been a while since his Salthi or Dralthi were finished, but Howard Day has finally kicked out another awesome rendition of a classic Kilrathi fighter. Check out the Jalthi model below. 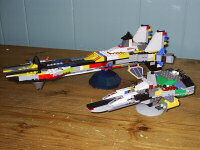 There's even a comparison with his other designs (including an original one inspired by the Sartha). 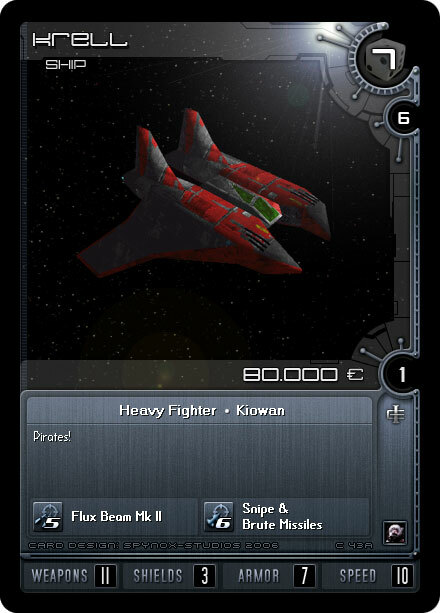 Howie used some artistic license when detailing the new fighter, but the results look fantastic. Let him know what you think over at Crius.net. I've done a bit o' work on the Jalthi. Tried not to modify it much from the original version. It was also sort of tricky to give the proper feeling of bad-assed bigness... Any thoughts? Execute the package to create the wca.rar file. 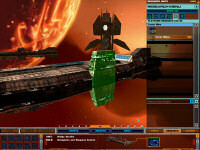 Move wca.rar to Homeworld 2's "data" subdirectory. 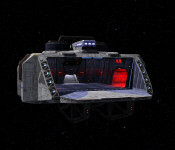 Create a shortcut to run Homeworld 2. Run the shortcut to start the mod. Or just redownload the file and try again. 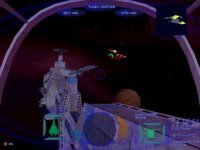 Aaron Thomas has released a package to give anxious fans an early look at the WC4 Homeworld 2 mod. This test demo is mainly intended to let people play around and marvel at all the amazing things that have been added to the engine. Be aware that artificial intelligence has not been implemented and things such as multiplayer connections may not work properly yet. 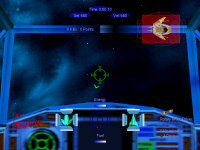 Lots of new ships, sound effects and interface graphics are all ready for you though. To give the preview a try, start by downloading the 114 meg pack here. 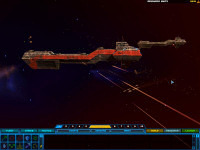 Make sure Homeworld 2 is already installed and that the downloaded file makes its way to the \homeworld2\bin\release\ directory on your hard drive. Run the file to automatically install and load the mod. 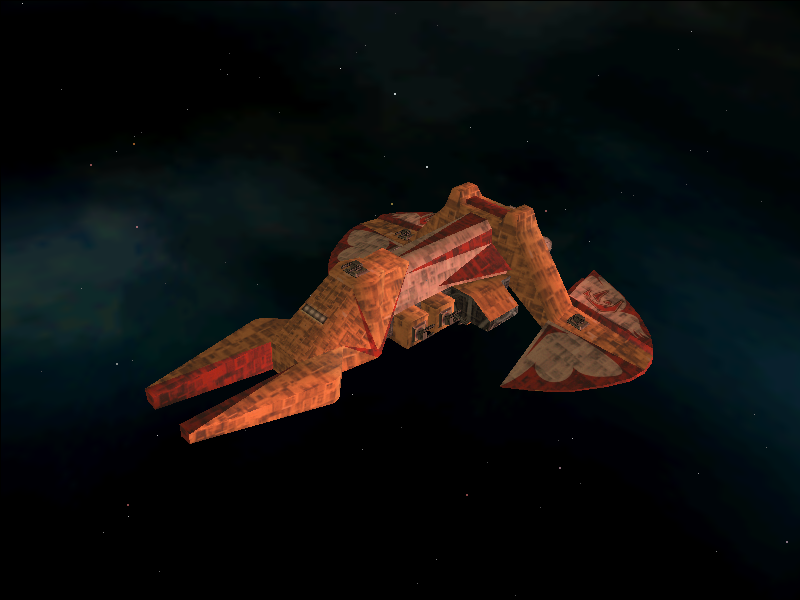 Visit the Crius thread about the project to provide feedback, get help or suggest an official name for the mod. 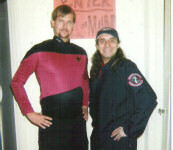 Everyone's favorite Flight Commander programmer, Eddie Benowitz, sent along these nifty pictures from his Halloween party last month. 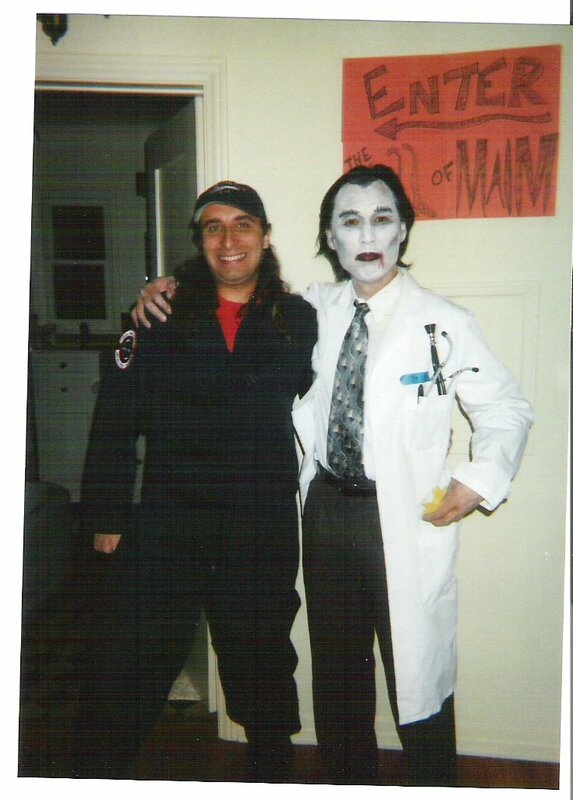 Guess who had the coolest costume? 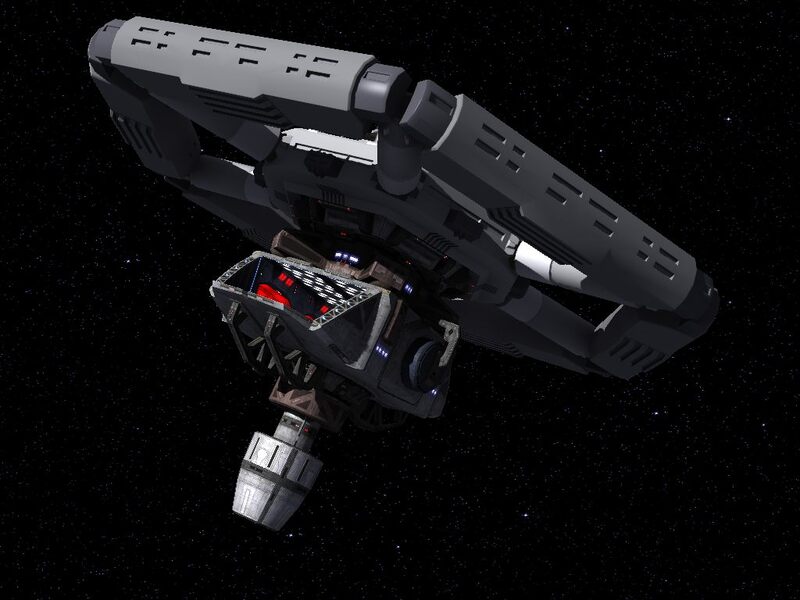 When he's not working on Wing Commander projects, Eddie programs robotic space probes. It sure looks like they know how to have a good time at the Jet Propulsion Laboratory! 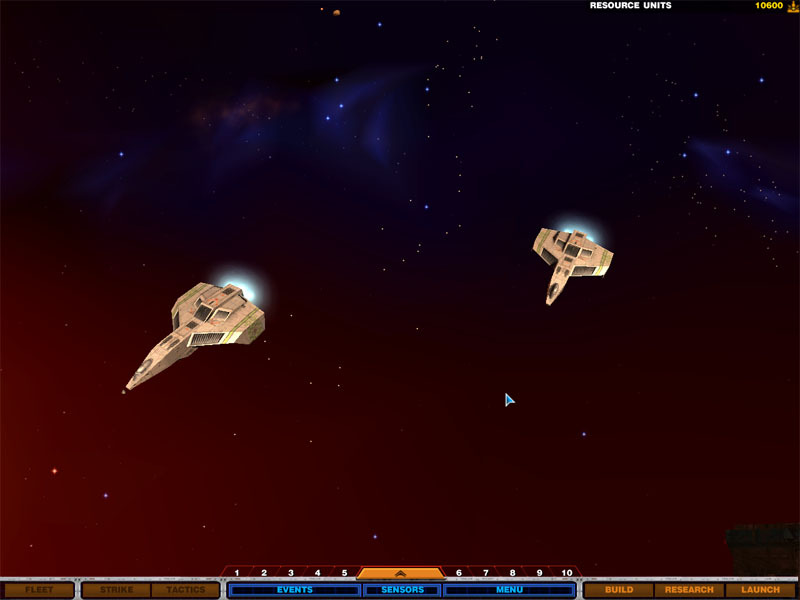 John Cordell sent along a title and ending screen revision to be featured in the next update to Gemini Gold. 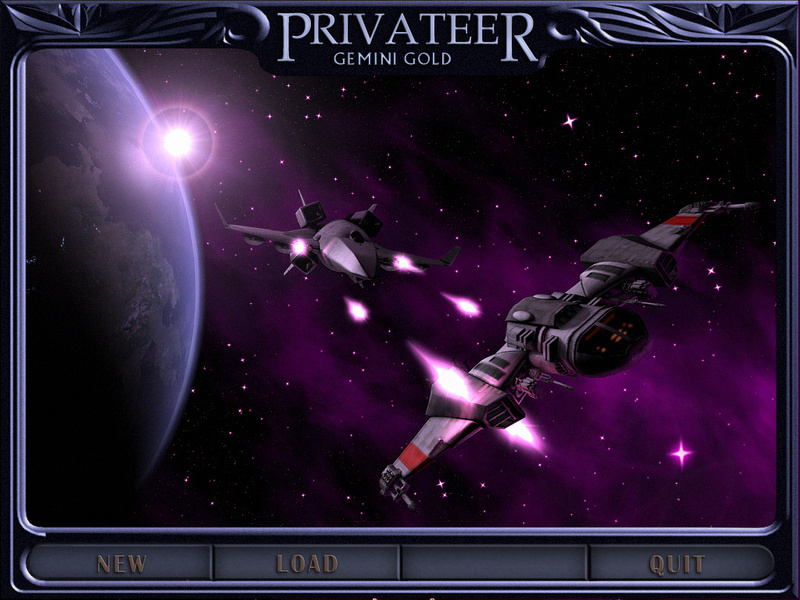 There wasn't a separate screen that popped up when you died in the original Privateer, but the image they've created for this looks pretty sharp. 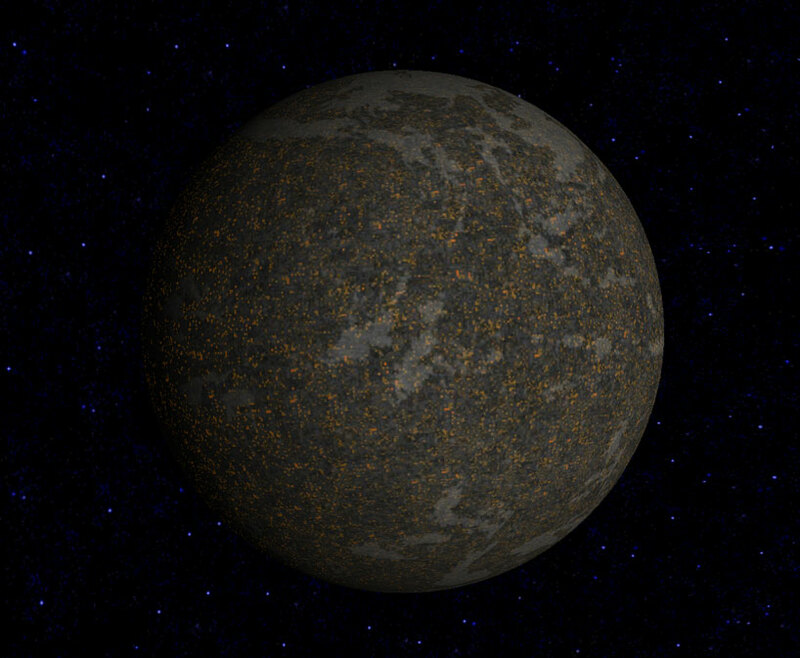 No release date has been set for the next Gemini Gold patch, but version 1.02 is probably several months away. If you like these, also check out the Pioneer project's take on splash screens. 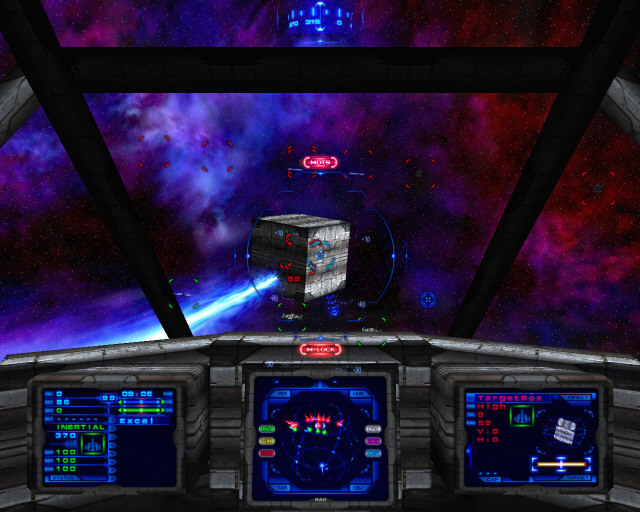 Iceblade has released a couple more cockpit designs for use in an upcoming Ranger's Glory update. He hopes to publish the next release around Christmas again. In preparation for this event, the RG FAQ has gotten a slight update. If you haven't been following the story behind this mod, you might consider playing Unknown Enemy. Ranger's Glory will occur at approximately the same time and play off elements from the famous Secret Ops mod. 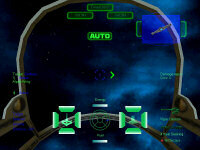 You can also find more fan-made Flight Commander HUDs here. November's winding down, so now's a good time to chew through some bandwidth. CIC Holovids is a great place to start. Tons of videos from prerelease trailers to deleted scenes to full game cinematics are available. 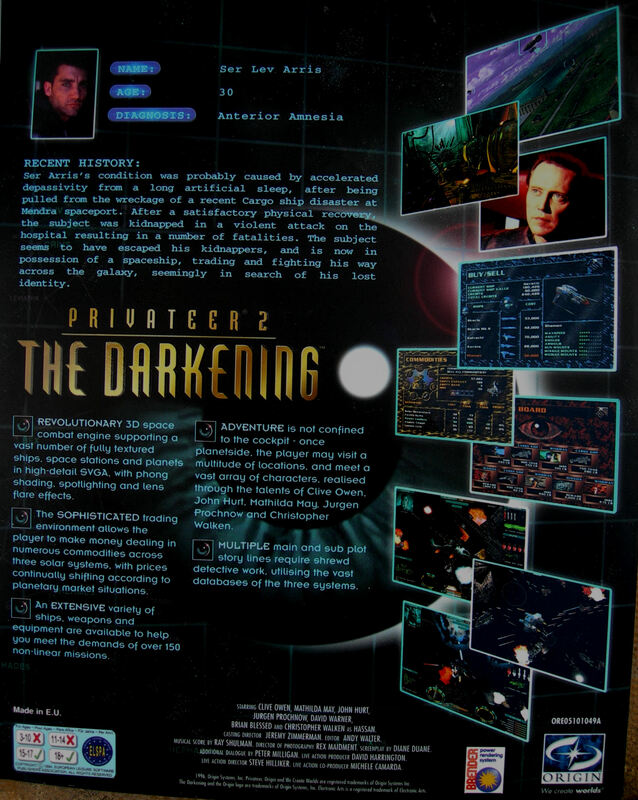 One particularly neat area contains movies from Privateer 2. It includes most of the main plot videos (two notable exceptions are the intro and first Joe scene) and side plot cinematics in higher quality encodings. 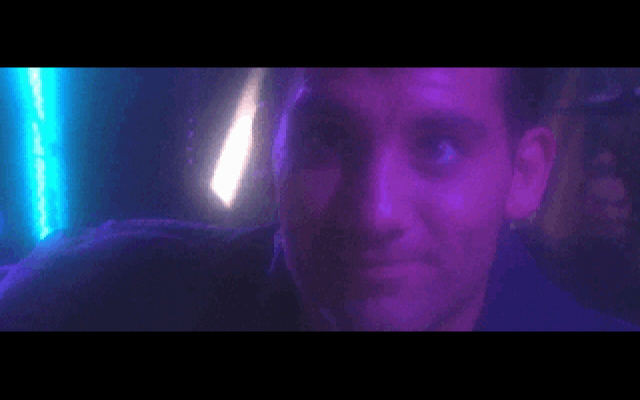 Our Holovid movie section also archives fan music videos, but so far there has only been one made for P2. Maybe this improved source material will help a few talented fans put something together. 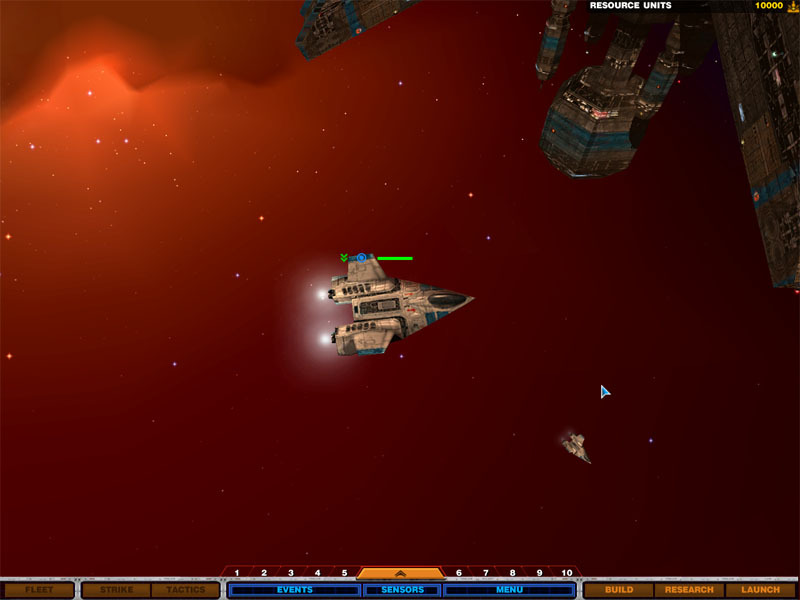 Arvoch Conflict is a space sim that managed to slip out quietly about two months ago. 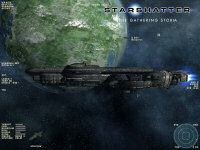 It's part of the Star Wraith family, along with Evochron and Riftspace. 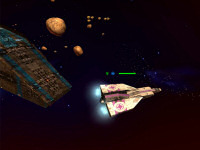 The story features your typical mysterious alien menance challenging humanity, but some of the missions have been beefed up with interesting gameplay objectives such as clearing mine fields, assaulting planetary installations, rescuing ejected pilots and setting up a network of shield buoys. 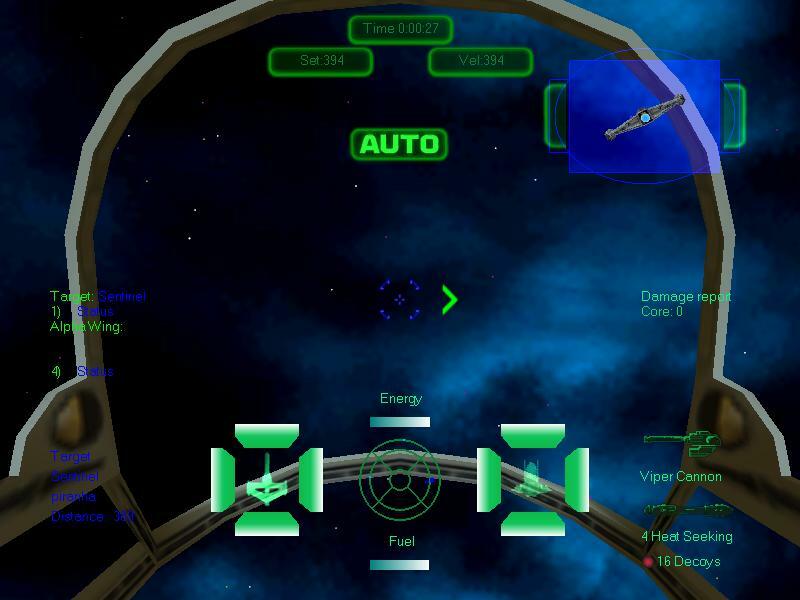 Although the game is not an open Privateer style experience, players can engage in free flight mode to test out various options and practice. 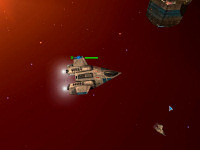 The game is mod-friendly and readily accepts new ships, HUDSs and weapons. 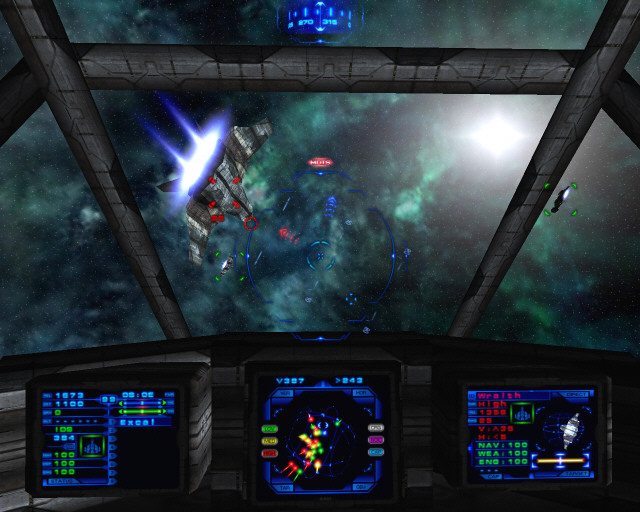 Cockpit displays are also individually rendered in 3D for detailed radar displays and target analysis. 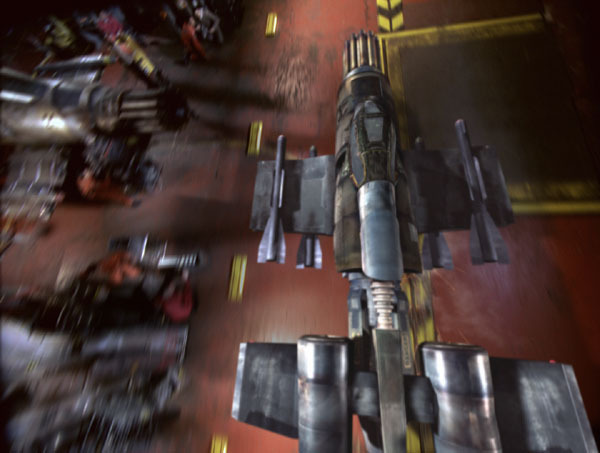 The entire 3D cockpit can even be visually scanned with the aid of the NaturalPoint Head Tracker. 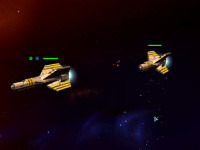 Flight mechanics are based on a light real-physics model, and multiplayer options are included. A small playable demo is available to try it out, and the final game is available for digital purchase from the Arvoch website for $24.95. 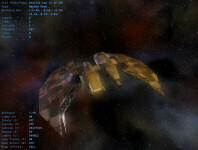 Deacan has posted another update to a Privateer 2-based project. 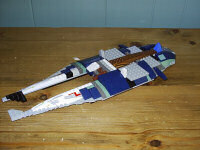 He and Hudson have a new batch of Kiowan and Jincilla ships for the card game they are creating. Shuttles, cruisers and medium/heavy fighters made this release, and you can differentiate the two clans' craft by their distinctive orange or red markings. 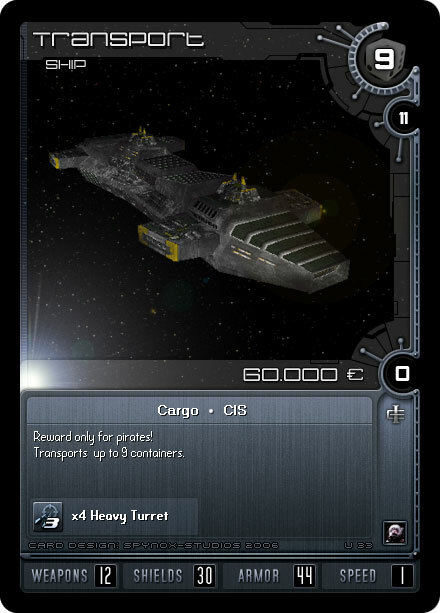 As more and more ships are completed, some of the unique cards and game mechanics are being considered. 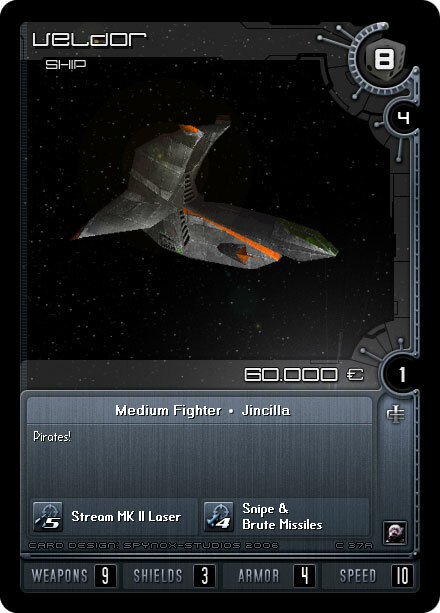 If these designs don't look familiar to you, check out CIC Green for diagrams, stats and background information on each ship from Privateer 2. 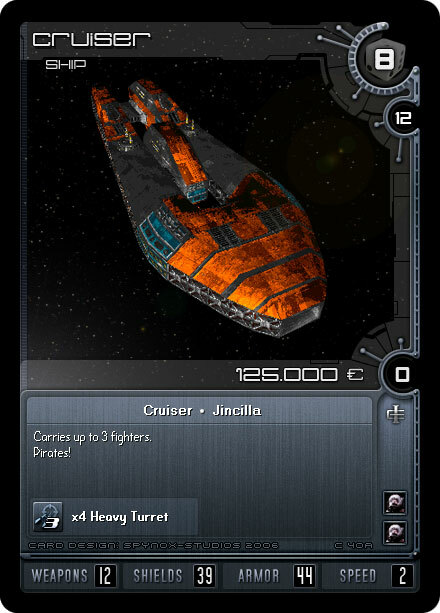 The PR6B Cruiser of the Jincilla pirate clan is the heaviest pirate cruiser in the Tri-System. 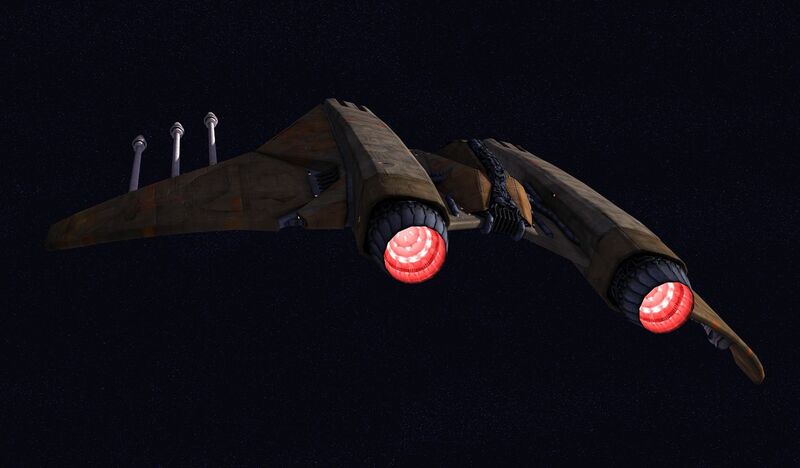 It boasts more armor and more turrets than any of its contemporaries. It is also, by a significant margin, the fastest: the PR6B is the only pirate cruiser with an afterburner. 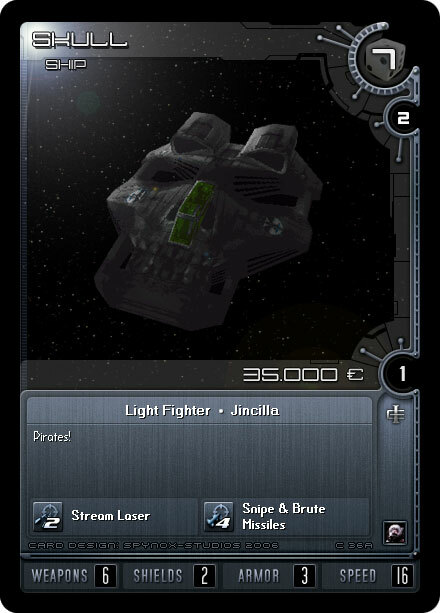 It is also the least often seen: the Jincilla do not regularly deploy their cruisers for specific missions: they remain hidden as deep space command posts for most of the time. Someone over at EA is working the Thanksgiving break, and they've posted an interview with Command & Conquer 3's cinematics director. The company appears to be taking the game's live action FMV component very seriously, and we're all interested to see how it turns out. A couple of new photographs from the set have been released, and they reveal a wonderful mix of detailed physical sets combined with areas marked for green-screen CGI. 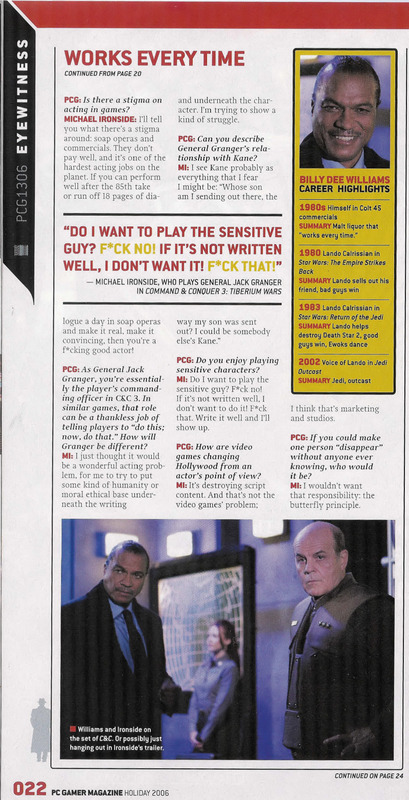 Q: Command & Conquer helped define the gaming genre back in 1995 when it introduced story-telling in video games through Full Motion Videos, i.e. live action. 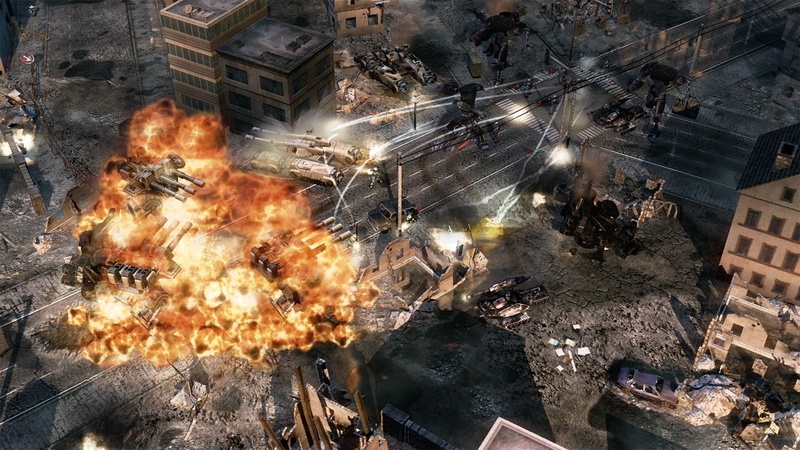 How are you taking the live action cinematics in Command & Conquer 3 to a new level of story-telling in video games? Surely they mean "introduced story-telling in video games through Full Motion Videos" to the franchise. 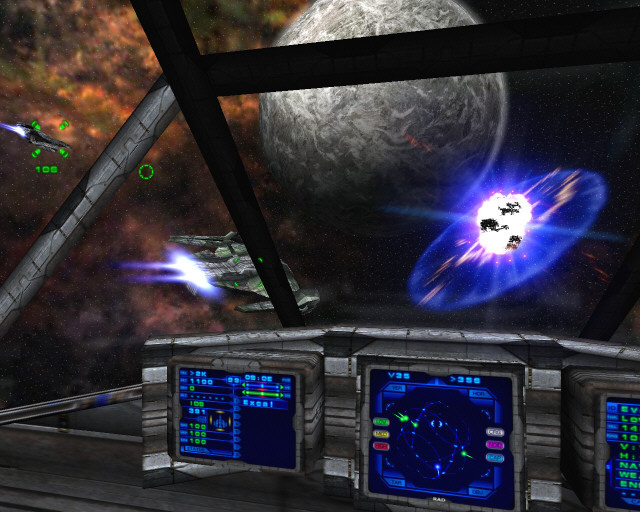 Wing Commander 3 sported a wider range of CGI environments and arrived nearly a year before the first C&C game. And here's another interesting quote. Q: Why do you think live action videos were the right fit to tell the story in C&C 3? A: First of all this franchise has a tradition of live action sequences for the cut scene material, but to me the most important thing is the believability and the emotional impact the player feels when a real human being looks you in the eye. 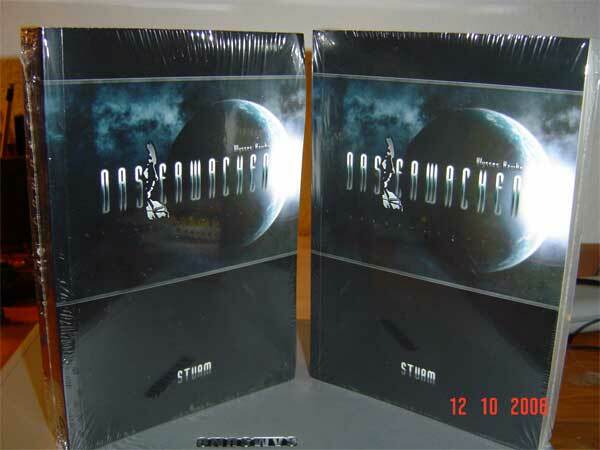 Deacan has managed to print a larger run of his Privateer 2-inspired fan novel Das Erwachen. The book has received an official ISBN and private seller page at Amazon.de in order to streamline the process for ordering a copy. The price is EUR 14,95, which is pretty much break-even after printing costs. To help facilitate some of their future fan projects, the team behind Das Erwachen has also set up a new website. 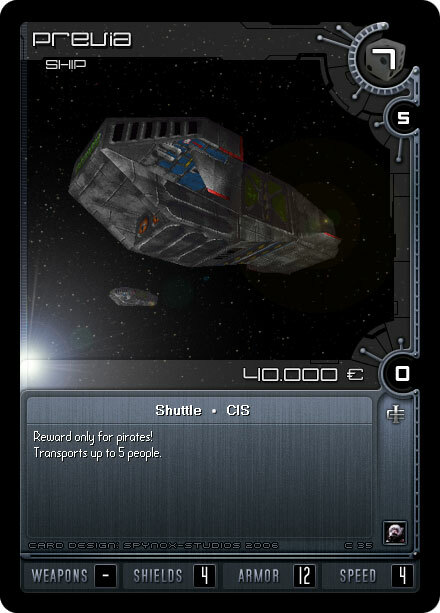 Discussion forums are available to plan things such as their P2 themed CCG. Credit for the center picture goes to Bakhtosh. Das Erwachen Book 1: Storm has actually been wrapped up for a little while now, and the second fan novel in the series is well under way. Deacan has posted a short excerpt from Book 2: Silence for anxious fans. Note that it is only available in German so far, unless you want to give the BabelFish a try. If more readers would like an English translation, they'll need to speak up (or better yet, volunteer to translate!). To help promote some of the great fan campaigns that are currently in work, eddieb is running a contest to determine the Flight Commander Mod of the Year. Ranger's Glory, a WC1 Remake, Perfect Plan, WC Affliction and Venom's FC simulator missions are on the ballot. Registered Crius.net posters can vote here. 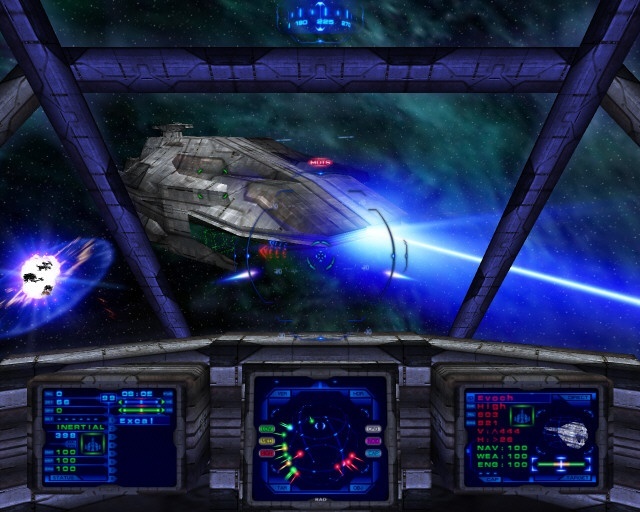 Flight Commander was inspired by Wing Commander Prophecy's Vision Engine and allows fans with just basic modding experience to get in and make their own games. 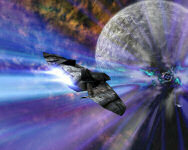 The program is flexible and allows experienced programmers to create more elaborate missions as well. You can learn more at the FC website or find help from fellow fans at the project's Forums. Today is one of the largest holidays in the US, and indications are that more people are traveling than ever this year. 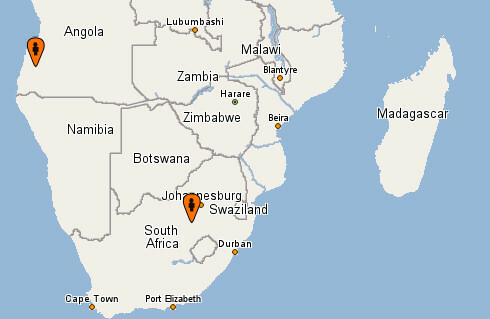 Poor weather is also affecting much of the country, so hopefully everyone stays safe. If you're stuck at home alone, feel free to drop by #Wingnut and talk about Pilgrims to your heart's content. For both those who do and don't celebrate today, some of the biggest electronic, media and gaming sales of the year are about to kick off. Hit the Discuss button below to share any particularly slick shopping deals you manage to score. 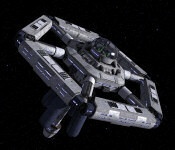 The Deep Discount DVD Sale has been extended, so fans who missed out last week still have a few more hours to score cheap copies of the Wing Commander movie or any other DVDs. WCEAR is very, very hard. This is a good thing, as far as I am concerned. A game that makes you believe you are getting better as you go along is gold. 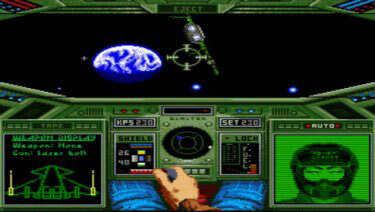 The original Wing Commander did this fairly well, and Origin's Wings of Glory perfected the experience. WCEAR does this in spades; it may take half an hour to finish an individual mission... but by the time you get home, you will feel that you have truly earned you rfive kills. 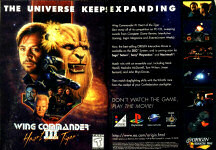 Would that Wing Commander III had given that same emotion. At the same time, let us admit that this is not wholly intentional. 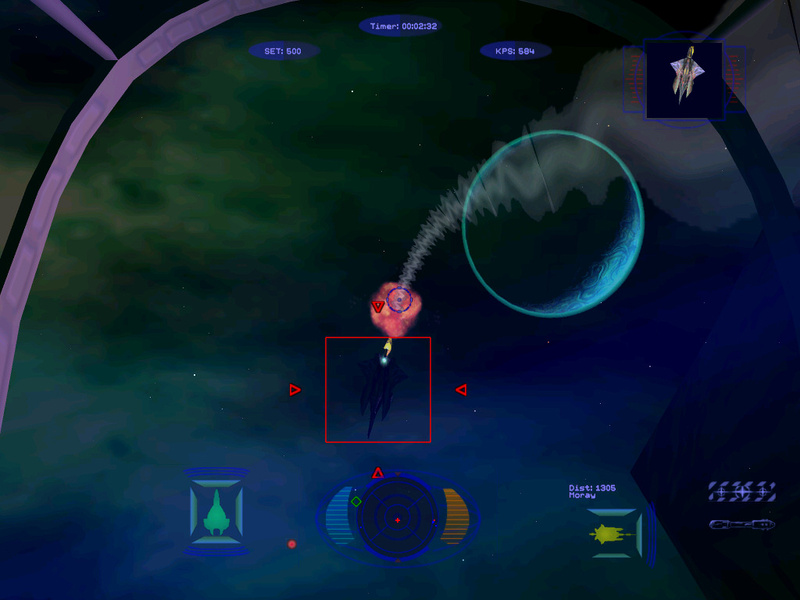 At best, it is half intentional, the result of the Mindscape team's best efforts to copy the gameplay of the original Wing Commander. 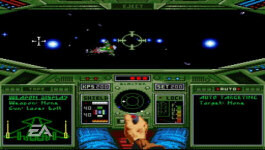 The other half comes from the controls and the engine limitations on the (emulated) SNES A veteran space fighter pilot who has perfected the experience with a keyboard, throttle, rudder and joystick will have trouble adapting to eight buttons and a directional pad. With some practice, though, it becomes second nature. EA Replay explains that the 'triangle' button is the "modifier". Keeping this thought in mind allowed me to figure out the controls with much more ease than previous console ports... they're intuitive once you put yourself in the right mindset, but they're maddening until that point. 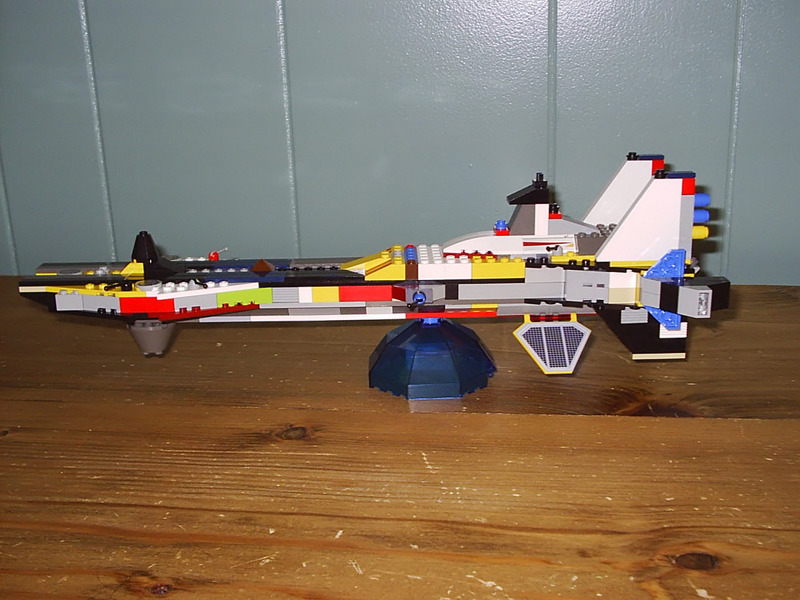 The amount of work you put into it is ultimately proportionate to the reward -- you will feel good when you shoot down your first Krant, you will feel good when you earn that first Bronze Star. You can find all my comments in this thread, and we'll put together a polished review once the entire game has been finished! 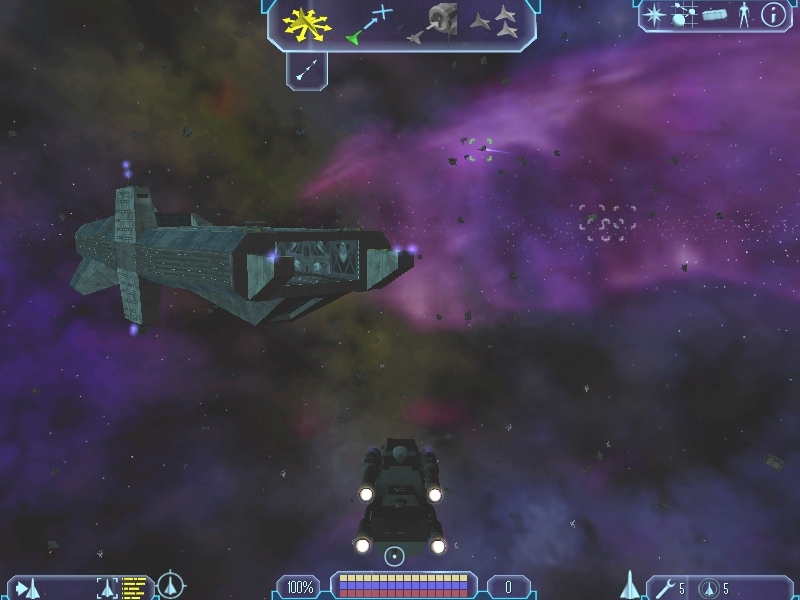 The online game delivery service GameTap has added Tachyon: The Fringe to its playable library. Although the company began with a relatively limited collection of classic titles, its games roster has expanded dramatically over the last year to include a wide variety of more recent items. 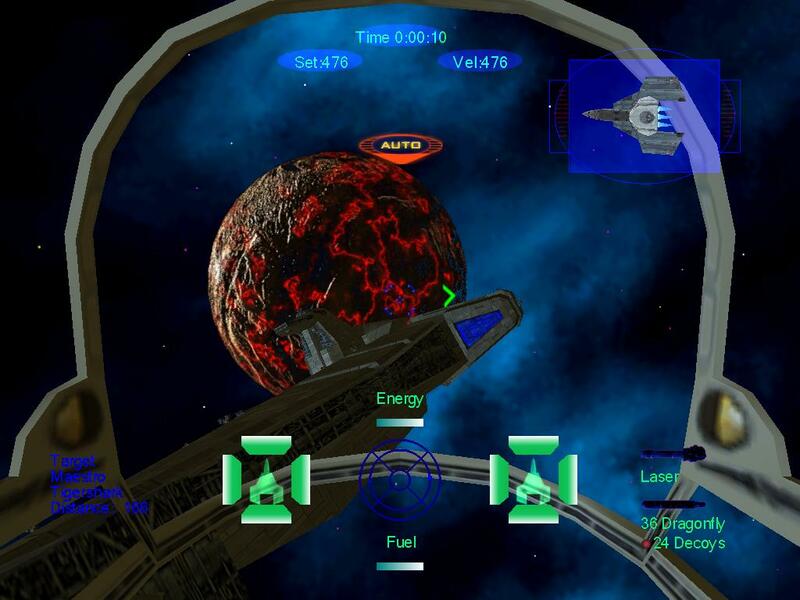 Tachyon was one of a handful of space sims released in the very early 2000s to modest sales and reviews. The game's basic structure is similar to Privateer with a branching story and multiplayer components. 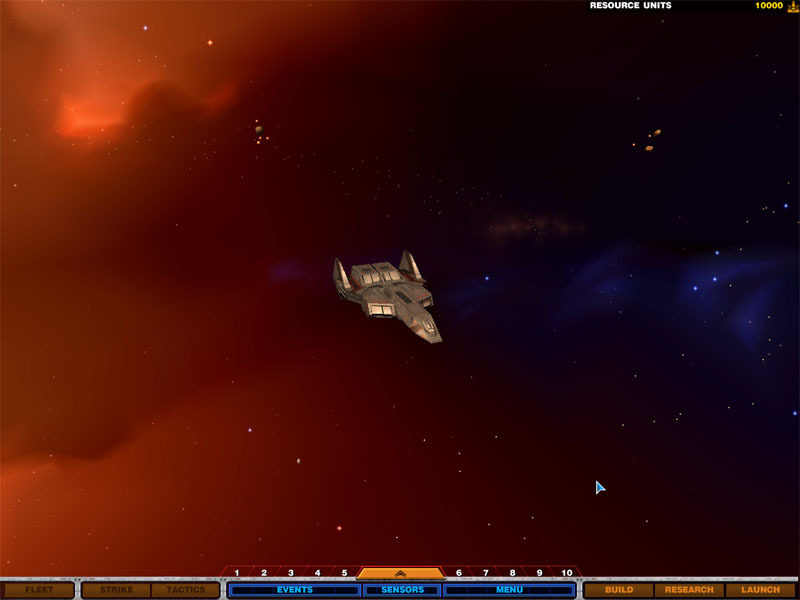 It joins Battlecruiser Millennium, Freespace, Star Fury, Universal Combat and a handful of modern combat fliers in the growing list of simulation games available to subscribers. 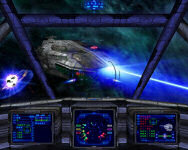 Wing Commander Privateer has also been announced as a future addition, although it and other EA games have been somewhat slow to appear on the service. Howard Day took a break from fancy modeling to create a batch of classic targeting schematics. 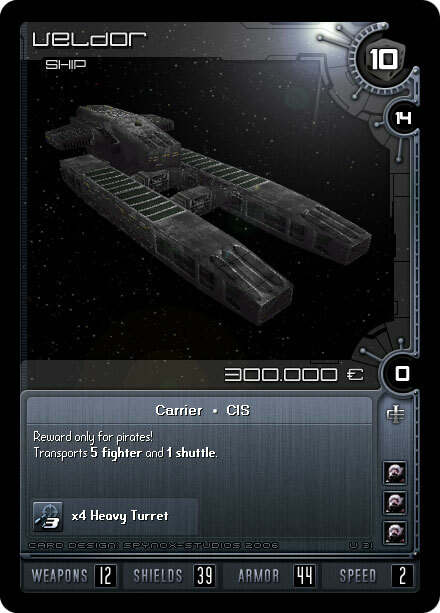 Six familiar designs are featured below, but he has also made images for a variety of new ships that will be featured in WC Pioneer. 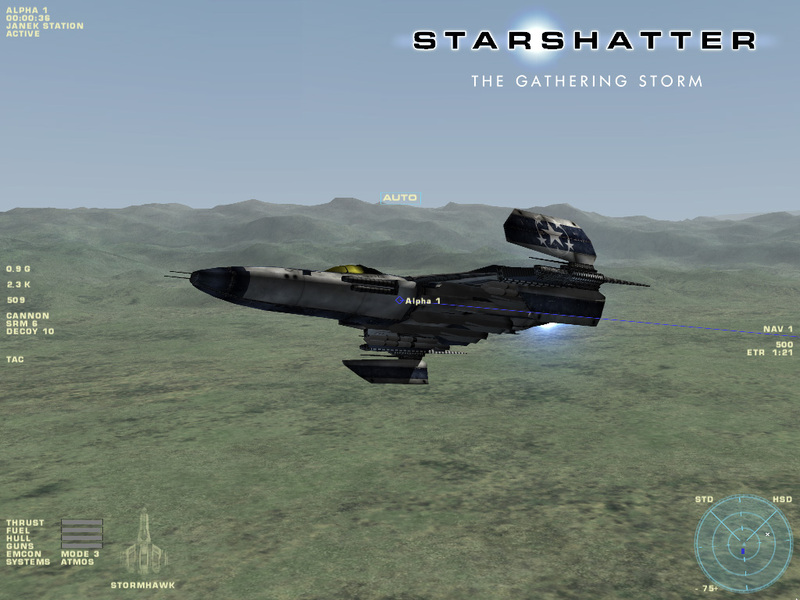 They all look pretty sharp and should help the team put together a preliminary flight demo. 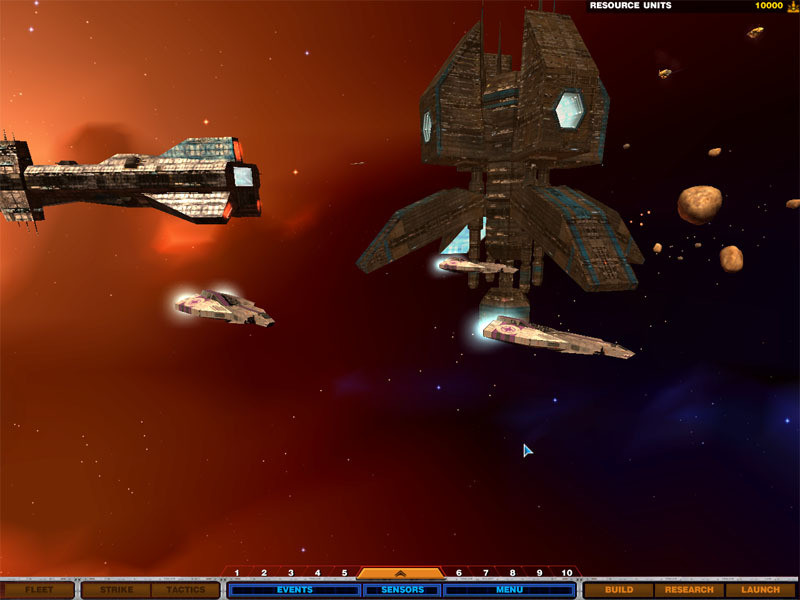 Similar displays for capital ships are still in work. 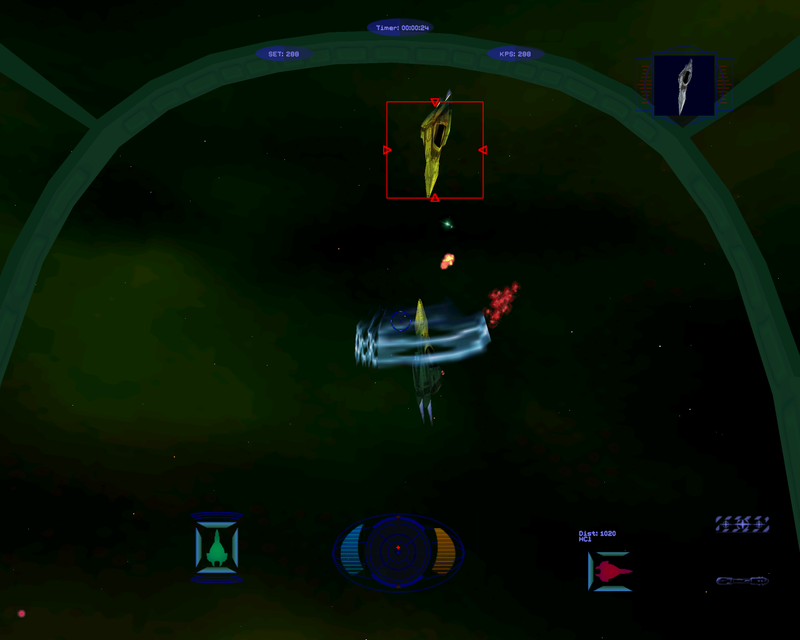 Fighters and other vessels that the players can pilot will have a more detailed diagram that notes ordnance and active guns. 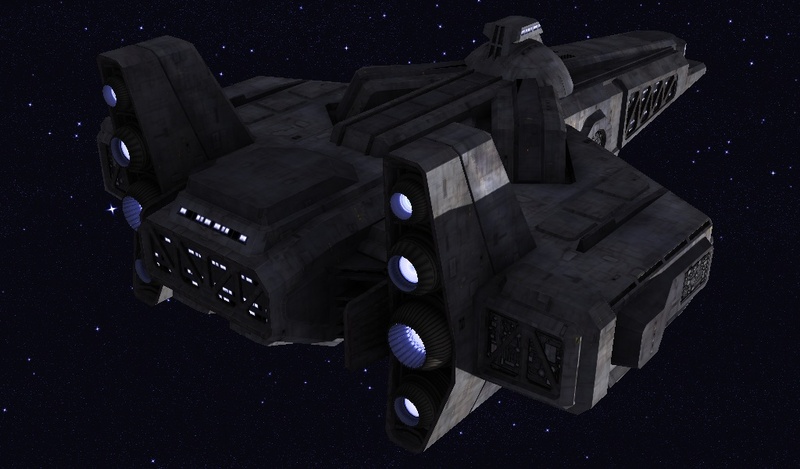 If you think these are neat, check out the upgraded Ships Database for authentic VDU images from each of the Wing Commander games. One of the biggest selling points for Sony's new PlayStation 3 console is its backwards compatibility with PlayStation and PS2 consoles, however the feature has some big problems. Audio distortions and freezing hangs are affecting both PS and PS2 titles. Approximately 200 games are known to have issues at this time. To help players determine if their games will work on the PS3, Sony has created an online database to organize and communicate compatibility problems. 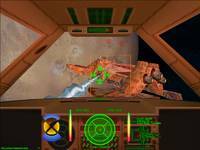 A search for PlayStation versions of Wing Commander III, Wing Commander IV and Crusader: No Remorse display a message indicating that there are no major problems with playing these games. 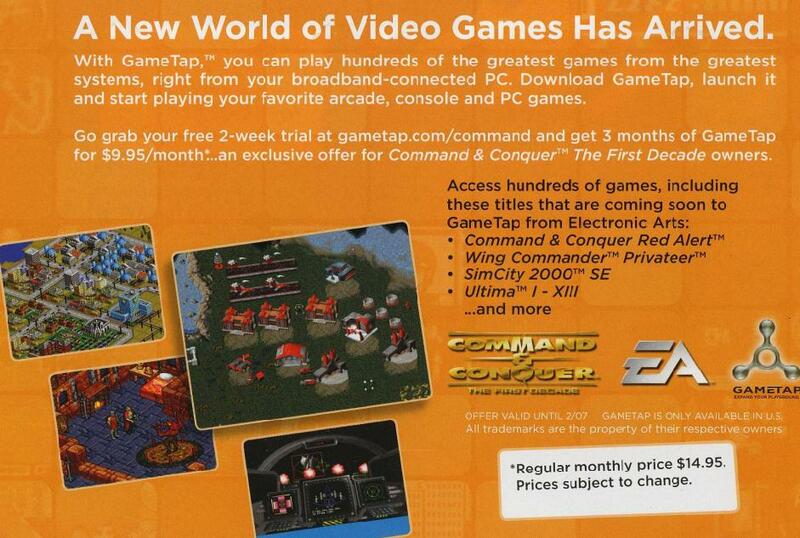 For the time being at least, it appears to be good news for Wing Commander fans. If anyone has a PlayStation 3 and experiences anything unusual, please let us know. You can check the status of these games and all other titles at Sony's compatibility database. 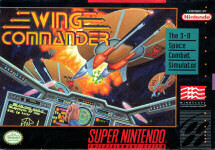 EA Replay is not the only Wing Commander game that gets slightly different box art in Europe and North America. 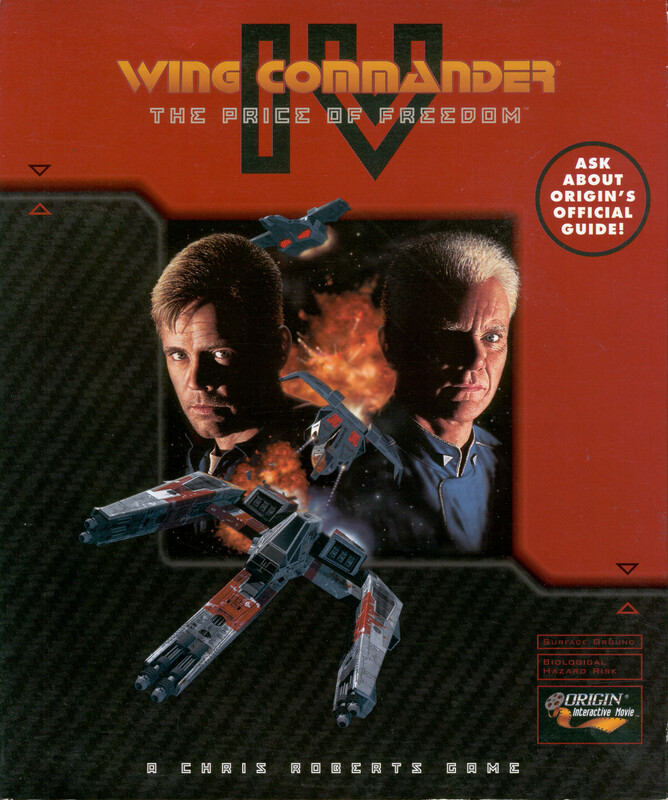 Here's one that many of our readers may not have seen yet: the European cover design for Wing Commander IV. 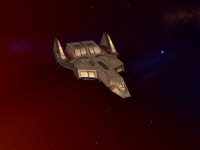 The cool red makes way for larger shots of Blair and Tolwyn with a Black Lance symbol looming between them. 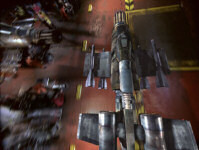 A Lance fires a different set of guns and the Banshee gets shot up less. 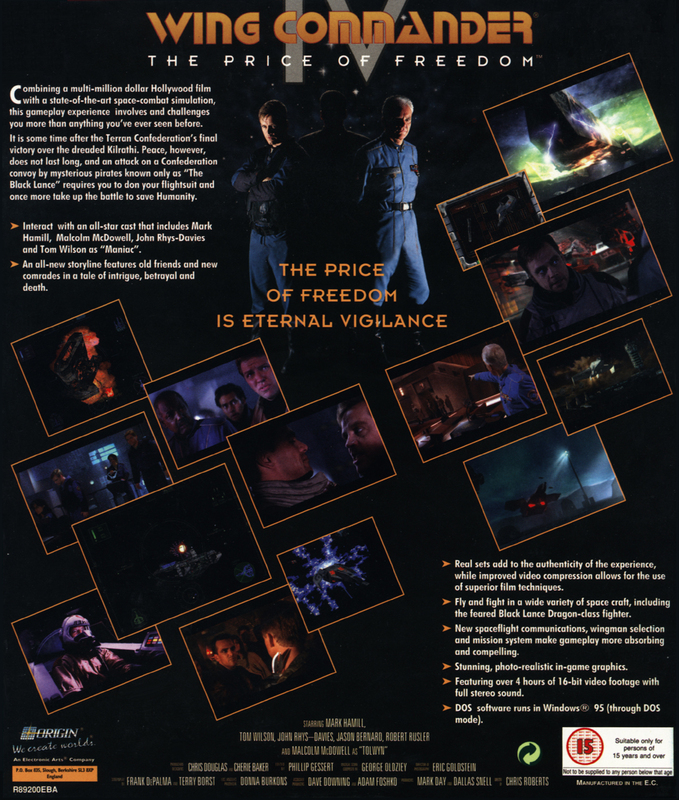 The back side focuses on the interactive movie elements in a slightly different way and uses some different screenshots from the game. 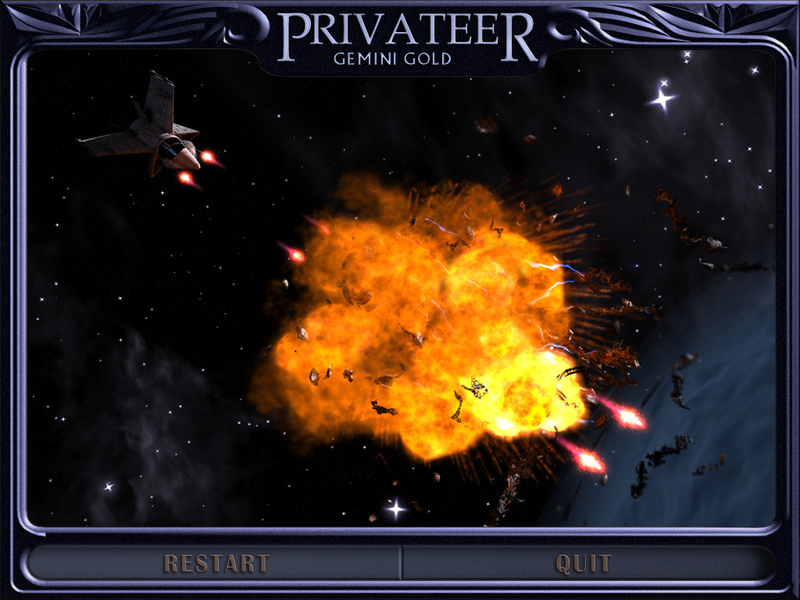 In August we also showed you the different Privateer 2 box designs. It's been another blazing fast year, and it's already time to prepare for our annual fan awards. Scores of Wingnuts are actively engaged in dozens of different endeavors, and next month we'll begin taking votes for Fan Project & Web Site of the Year to recognize some of them. 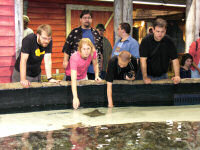 Before the contest begins, visitors can submit suggestions for nominees. You can find past winners listed here. Standoff, Gemini Gold, WC Saga and Fleet Tactics took the top spots in 2005. 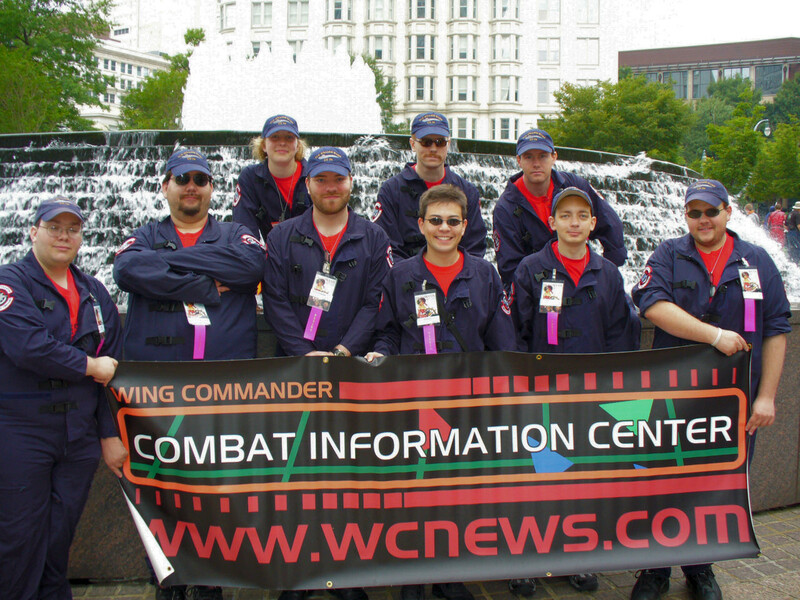 Email vote@wcnews.com to recommend Wing Commander web sites, game mods or original projects that helped make 2006 an exciting year for fans. You could be forgiven for wondering just what the heck has been going on with HTL these past few months. The bad news is that there have been a lot of big changes in my life that have left very little time for running HTL as I would have liked to. The good news is that, well, it's all been due to good news. I've been accepted for a PhD programme back home in New Zealand, something that I've been aiming towards for a while. What that meant was that I had to leave the UK, where I had having a working holiday for the past couple of years, leave my old job and flat, move back to New Zealand, get my things shipped over, etc. As you might imagine, the last few months have been hectic. I won't promise that things will get back to normal after this (I've made and broken that my promise before), but both my writers and I are committed to wrapping up HTL in the style it deserves. This particular story was mailed out on the Aces Mailing List a fortnight ago, but I had to wait till my regular PC arrived to get it uploaded. Future stories should be available on the List and the CIC simultaneously. 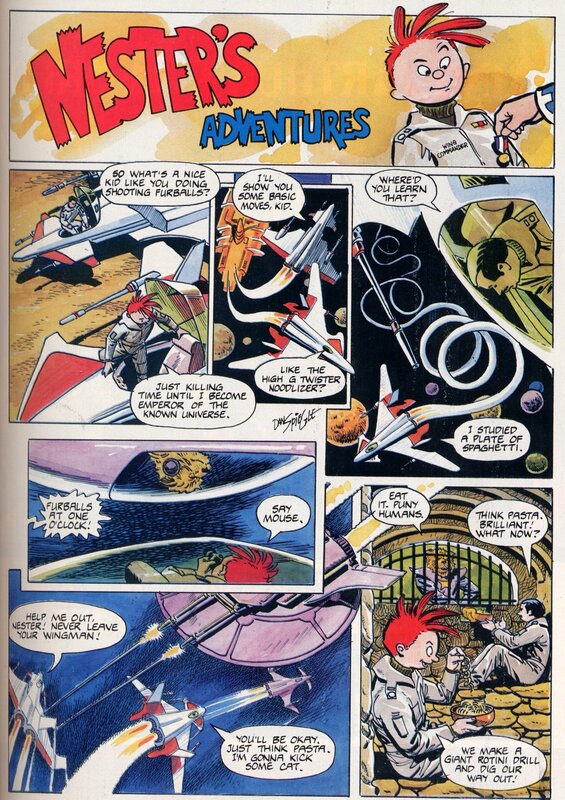 We kick our new set of chapters with a great story called "The Nemesis Gambit" written by Kevin "Leeloo" Tan. As you've seen in past chapters, the soldiers and agents of the Tanfen Corporation have been engaged in a bloody struggle with the Corporation's old enemy. There have been disturbing signs that the latest surge in bloodshed isn't just a continuation of the centuries old blood feud with Porhen, however. This story picks up from there. 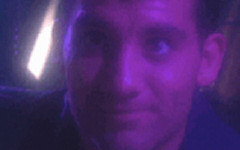 Please send any and all comments to Kevin at eva_ayanami_rei (at) hotmail.com, not to me. Now that the last two major systems in the new console cycle have been released, it's time again to ask which you'd prefer for your next Wing Commander game. Lots of things have changed since we last ran the poll, and the system that the next WC game ended up being for wasn't even an option back then. The PC isn't a choice in order to keep the results interesting, but there is amazing potential for new games with each of the listed options. Let us know which one you'd like to see a game on the most. 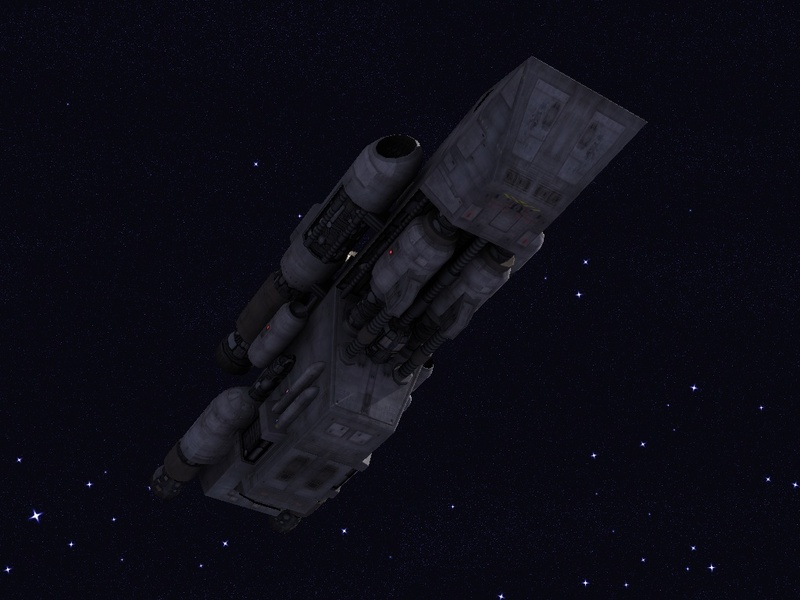 Battlestar Galactica was the winner of our last poll. I would've expected Space: Above & Beyond to take the top spot, but BSG's current popularity on television seemed to give it a good boost. Finally! After all those Budokan screenshots and some really, really long videos of someone playing Road Rash and Syndicate, we get a batch of Wing Commander images. 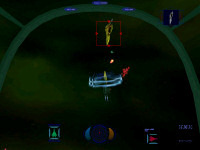 The PSP Gamezone has eight in-flight screenshots that feature a Krant, a Scimitar, a Salthi and a distant Dralthi. We also get a first look at the target and comms VDU. 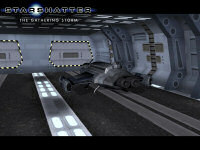 These and all other screenshots have been archived in our EA Replay section. 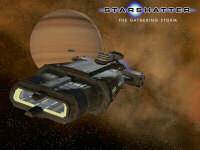 Hopefully we'll get some shots of the other ships and aboard the Tiger's Claw as we approach the European release date. In the meantime, we will try to make our own. Retro gaming compilations don't always get properly reviewed, but the first few have started to trickle out. Game Informer is up first with a very brief synopsis. Assigning a single rating a pack with more than a dozen games seems pretty difficult, so we wouldn't read much into their 6.75 score. Games Radar has a more complete review. Greg Sewart, who's been scoring Wing Commander games since the late nineties, was a bit a more critical this time. He starts with a caution: "All of the games on EA Replay suffer from a sort of "smearing," where fast-moving characters or vehicles streak a bit. 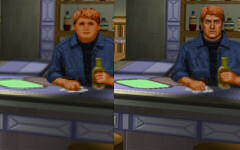 It's a symptom of the PSP's screen. It doesn't hinder every game to the same degree, though." 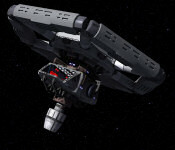 It's potentially a valid warning any time you're looking at an LCD screen, but none of the CIC staff has noticed this at all in Wing Commander (or really any other PSP game to a noticeable degree). 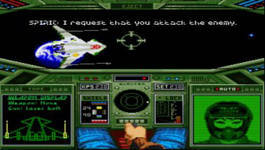 Technical issues are the main problems he says affect the Wing Commander ports, and some people might just be more sensitive to this. He also would have preferred the PC version, but using the SNES port and its controller-friendly interface seem to be a more logical choice. The final score is a 7/10. Last but not least, we missed a relatively complete preview of EA Replay that FutureGameZ posted a short while back. So in the end, you get six great games, and six mediocre ones. Not bad for 2,000 pennies, really. EA's history houses some great, forgotten franchises, and it's nice to see the publishing behemoth remembering its roots. 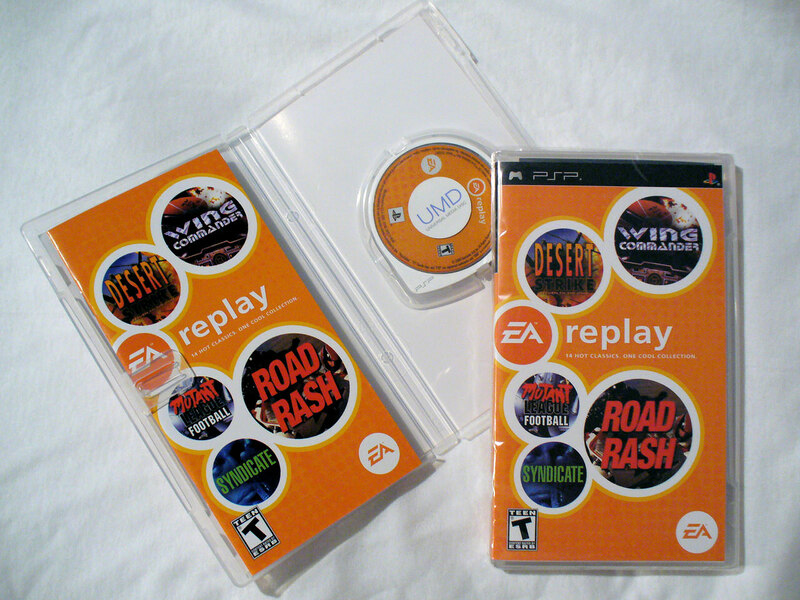 EA Replay is a cool little history lesson for younger gamers, and a great trip down memory lane for the oldsters among us, despite its problems. 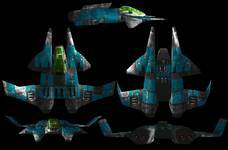 Marc is back with another impressive work of Wing Commander art. He began building New Detroit over a year ago and went through several iterations after receiving feedback from fans. 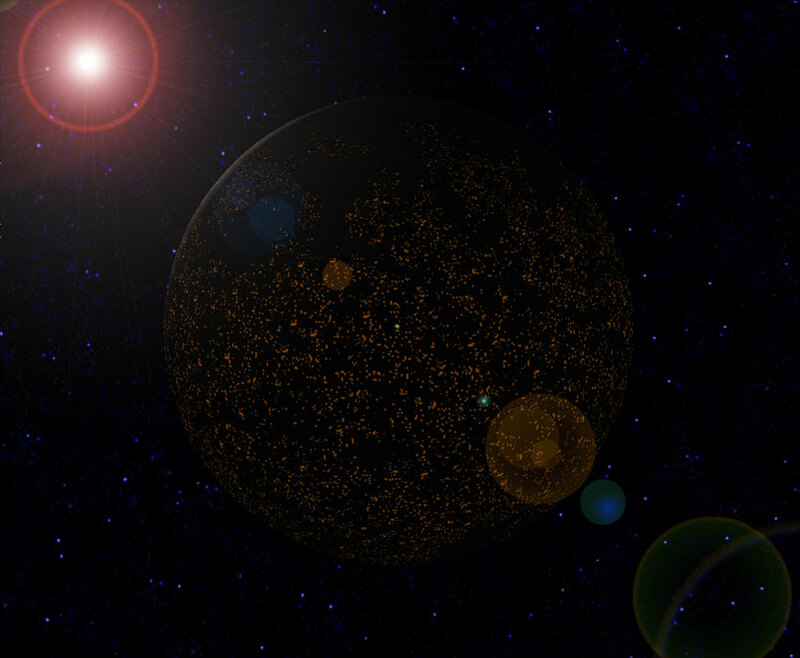 The first revision looks more like a planet that's simply made out of metal. Marc has improved on this in his new images by creating a a more organic world that appears to have been consumed by industry. 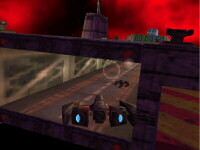 It also more closely resembles New Detroit as it was in Privateer. 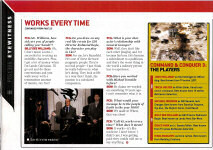 Electronic Arts announced yesterday that an XBox 360 version of Command & Conquer 3 is in the works. This should help to significantly broaden the audience for the game and give more people a chance to see EA's latest attempt at FMV with live sets. 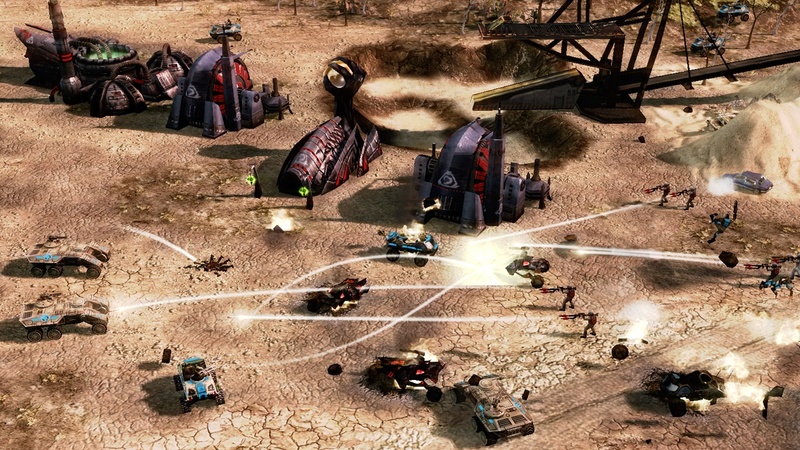 The company will be reconfiguring C&C's controls to work better with a console controller, similar to what they did for the well-received Lord of the Rings RTS released earlier this year. 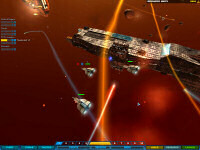 Electronic Arts also continues to have great success with XBox Live Marketplace, and numerous additions to the game will be available to download. 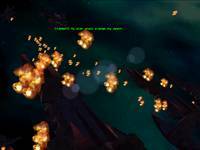 C&C 3 will be one of the most robust titles on Xbox LIVE(TM)(2), with a steady stream of downloadable content on Marketplace. 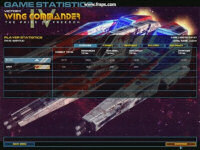 The first dashboard theme featuring amazing concept art from the development team will be available soon. From the team at EALA who brought you the critically-acclaimed The Lord of the Rings(TM), The Battle for Middle-earth(TM) II for the Xbox 360, C&C 3 will ship worldwide in 2007 for the Xbox 360 and Windows PC. 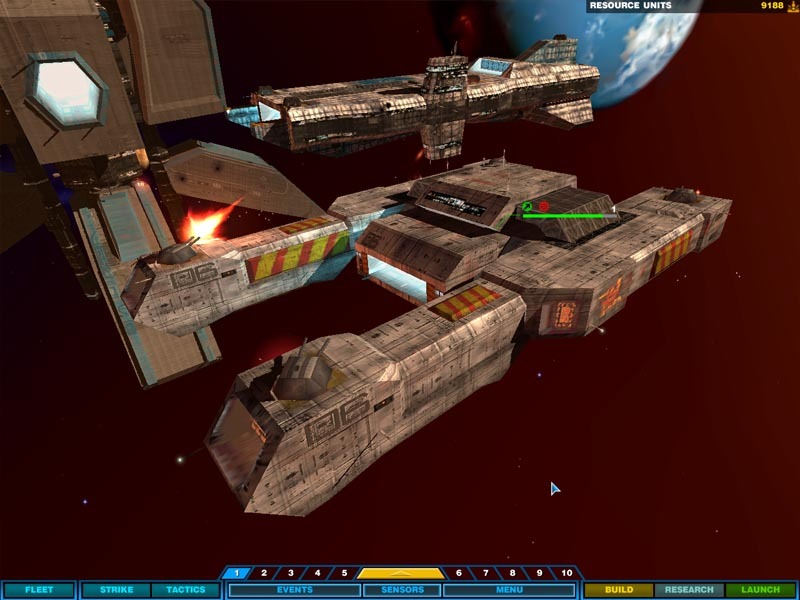 At long last, there's news from Wing Commander: Standoff, the fan mod for Secret Ops. 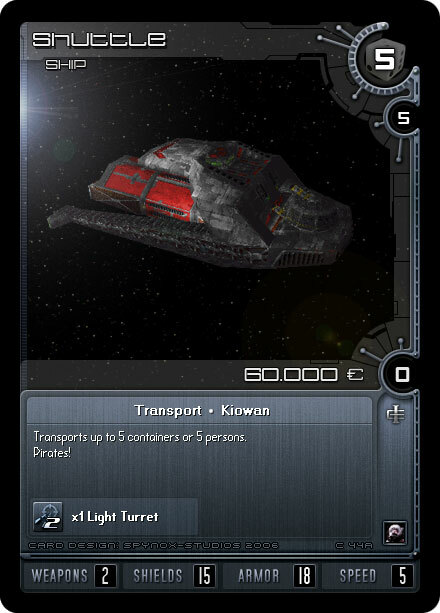 Taking a page from Wing Commander Academy, the Standoff team has turned a transport into a frigate! 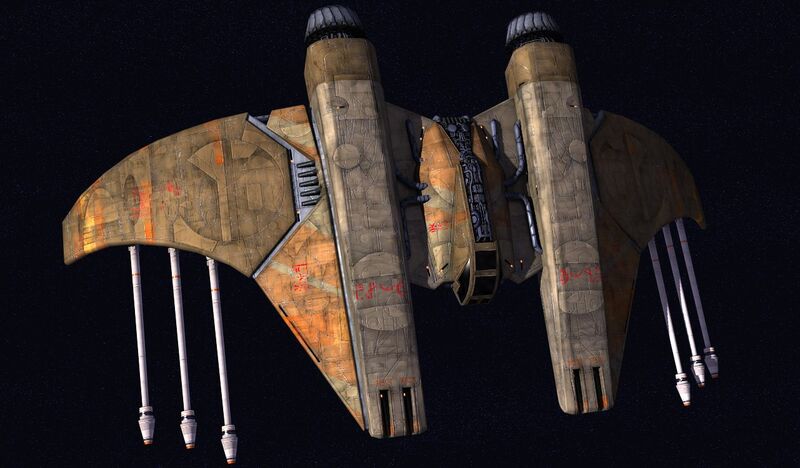 The rarely seen Wing Commander Armada transport design, which they've named Targu II, is now a Kilrathi frigate -- since such ships are mentioned several times in Fleet Action. 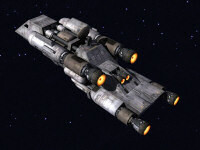 Two new profiles have been added to the website, one for the new frigate and one for Trigger. 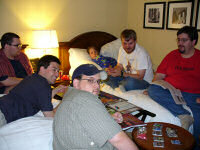 The team is currently planning to release both remaining Standoff episodes in 2007. Bride of They Reprinted a Press Release! For the archives, here are links to those those brave few news sites who bothered to rewrite Electronic Arts' EA Replay press release instead of just pasting the whole thing! In all honesty, we're more interested in your Replay experience... so head on over to the forums to share your thoughts on the game! Reports from all time zones confirm that EA Replay is now available throughout the United States! Anyone should be able to find a copy at their local GameStop or equivalent store. On a personal note, I've got mine! 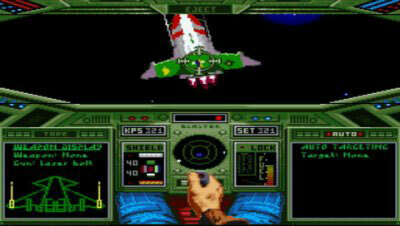 I picked up Replay in the birthplace of Wing Commander, Austin, TX. The game plays exactly like the SNES version of Wing Commander, and it features a very nice menu system that provides information and extras for each game. We'll have more in-depth commentary in the next several days... once we take a break from playing. For now, here's a look at the whole package! 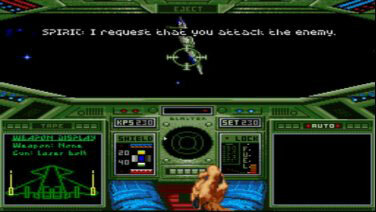 Wing Commander received, by far, the largest bubble on the back of the case... with nothing for Ultima. The release of EA Replay has given many Wing Commander fans another reason to celebrate their favorite series once again. Earlier this week, we channeled a little bit of that excitement with a themed contest. 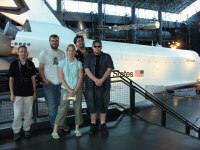 A group of dedicated Wingnuts stepped up and shared what they were feeling at Crius.net. They each earned avatars, but we also said one winner would get a copy of EA Replay for their effort. And that lucky fan is... AD! Instead of a more direct message, he wrote an elegant sonnet for the occasion (14 lines for 14 games!). Although we can't give each participant a copy, we really appreciate each fan's submission to the thread. We're here today because everyone continues to share their enthusiasm with one another in this way. You can find all the entries here. Let our victory spur others forward? 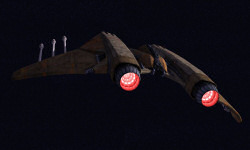 It has been exactly three months since the first rumor that EA Replay for the PSP was in the works... and now today is ship day. To further confirm this, Electronic Arts has finally updated their Press Site with the proper date -- today! Depending on how quickly the game reaches stores, it should be available all over the United States either Wednesday or Thursday. 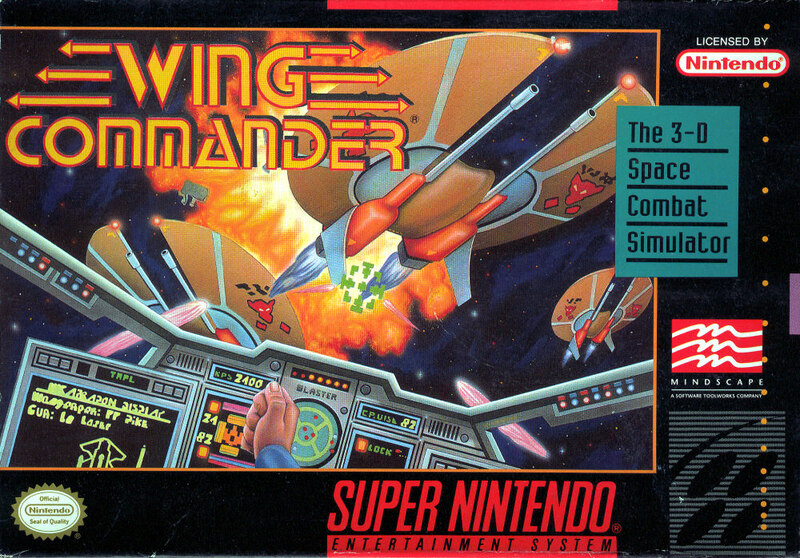 This seems like a small step, but it is very big news for Wing Commander fans -- for the first time in three years, you can walk into a store and buy a game with 'Wing Commander' on the box. 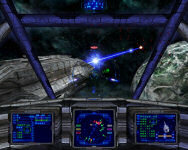 For the first time in eight years, a new Wing Commander game is available that was developed in-house by Electronic Arts. Make no mistake, this is progress. 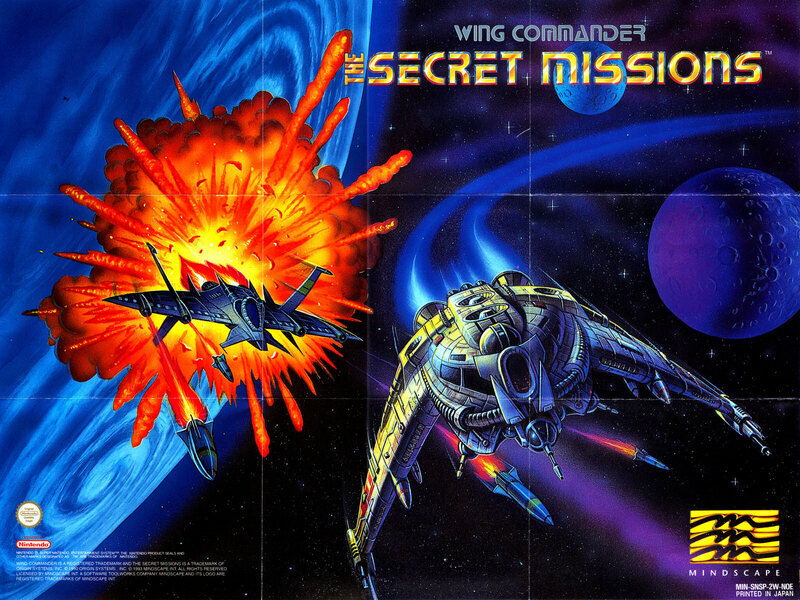 We are incredibly excited about this, and believe that many of you are too -- so to tide you over for the next twenty four hours, please enjoy this large collection of odds and ends about the original SNES Wing Commander and Secret Missions releases. Update: EA has issued a press release confirming that Replay is shipping today! 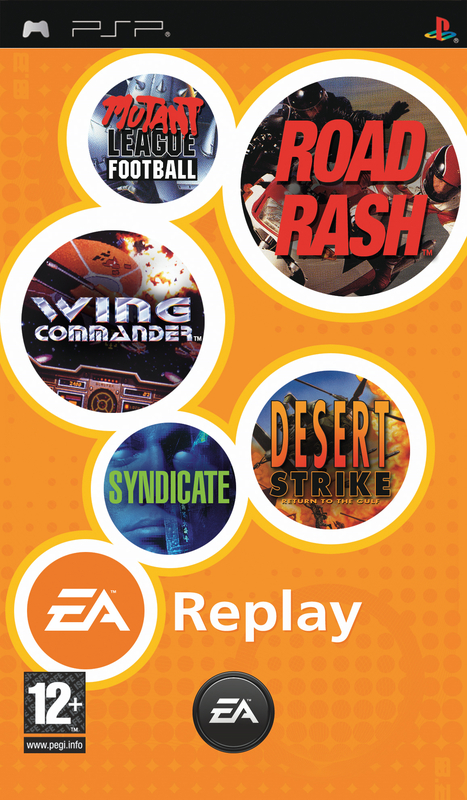 REDWOOD CITY, Calif.--(BUSINESS WIRE)--Electronic Arts (NASDAQ:ERTS) announced that EA™ Replay, the company’s first ever compilation of classic console games, will ship to retailers in North America today and in Europe on December 8 under the EA™ brand. Produced by EA Canada in Vancouver, B.C., exclusively for the PSP® (PlayStation® Portable), this catalog of 14 EA console favorites from the 90s aims to capture the simple, button-mashing fun that first hooked players all those years ago. By bringing original 90s console games to the PSP, EA Replay rejuvenates the way the classics are played. You can now go head-to-head with friends in multiplayer on select titles, unlock original game art, and save your game at any point. 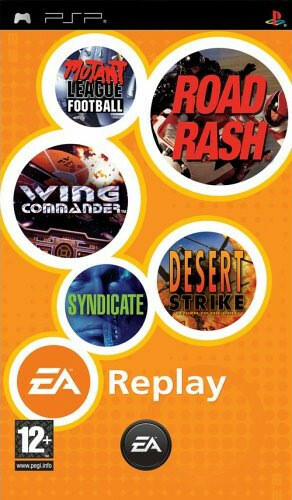 EA Replay’s compilation of celebrated hits gives you the chance to relive those epic moments that first sparked your gaming passion on-the-go. Included in the retro catalog are popular franchises such as the Strike series, Road Rash™ and Wing Commander™. You can read the complete press release here. In addition, Gamestop has updated their listing showing that Replay is now shipping. 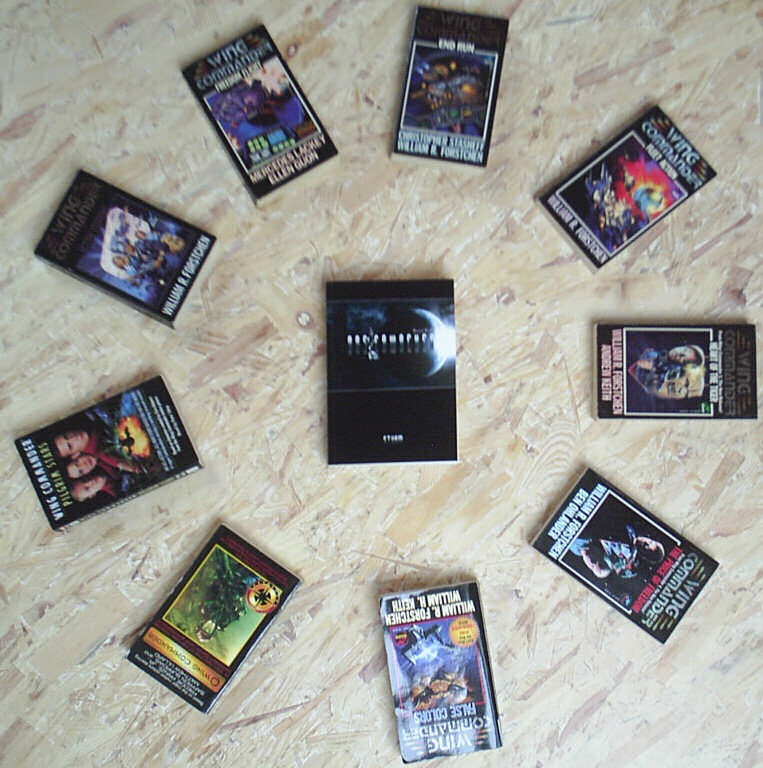 If you would like to win your own copy of the game, be sure to enter our contest -- there are only a few hours left! In honor of today's release of EA Replay, which features the SNES ports of Wing Commander and The Secret Missions, we're collecting as much information as possible about the original versions of those games in this special super-sized update! Enjoy, and remember to pick up your Replay as soon as possible. ... and there's even more from Japan! 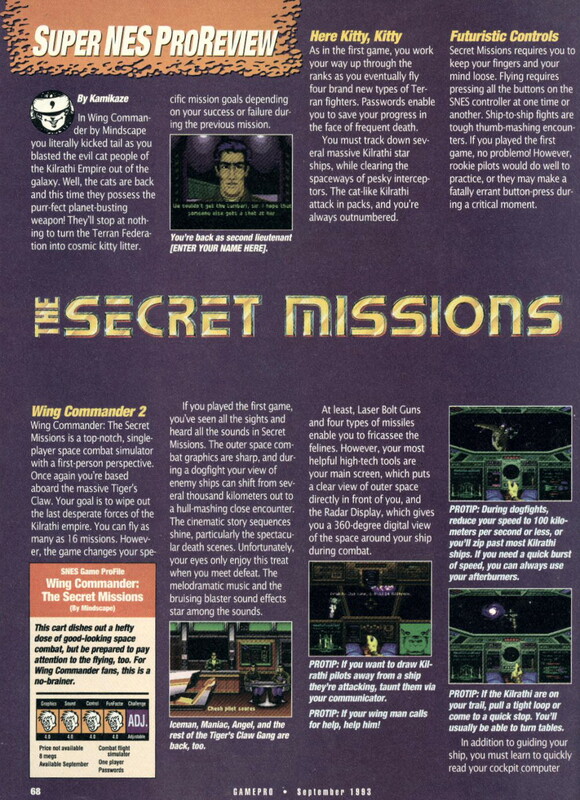 SFC Wing Commander's manual also features full color sketches of all the Tiger's Claw pilots! Ever wanted to see a 'manga style' version of Iceman? No? Well, you can anyway! You can find the entire set in our 'Head Museum' here. 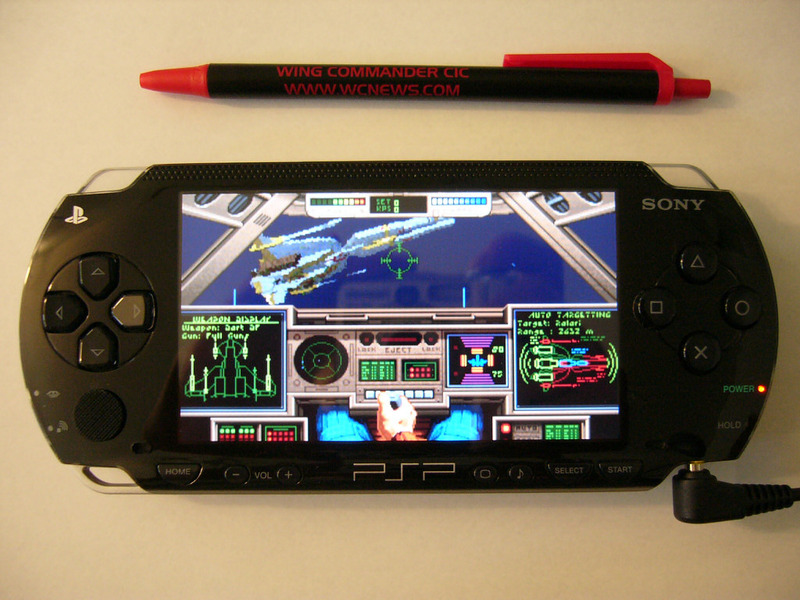 We don't know how Wing Commander for the PSP will deal with the manuals -- including fourteen manuals in a tiny PSP case would be pretty darned tough, though. 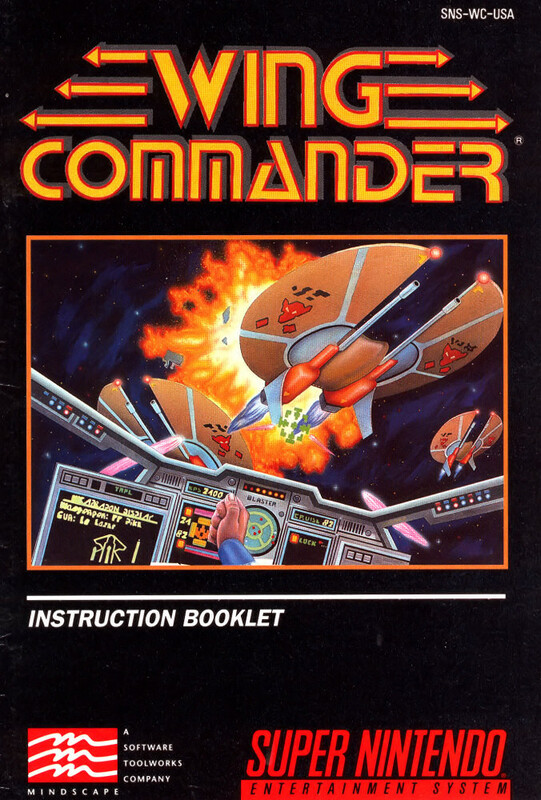 Luckily, we have a full text version of the Wing Commander manual here! 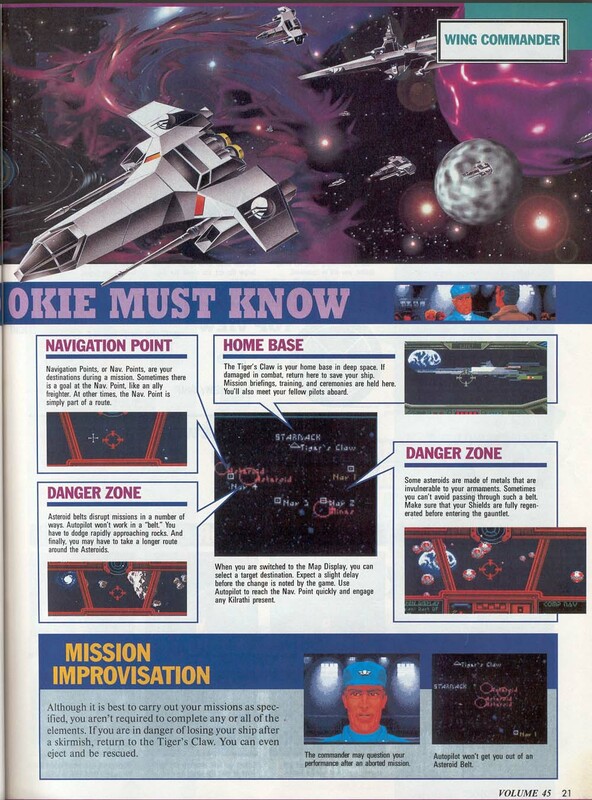 We also have single page quick guides that were included when people rented each of the games, for Wing Commander SNES and The Secret Missions SNES available! Failing that, you can experience a crash course in the controls alone here. Cats got you down? 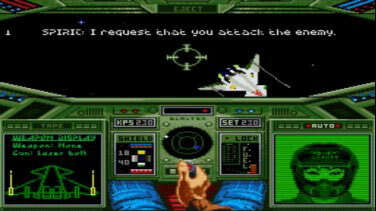 Well, it just so happens that there are cheats for both SNES Wing Commanders. 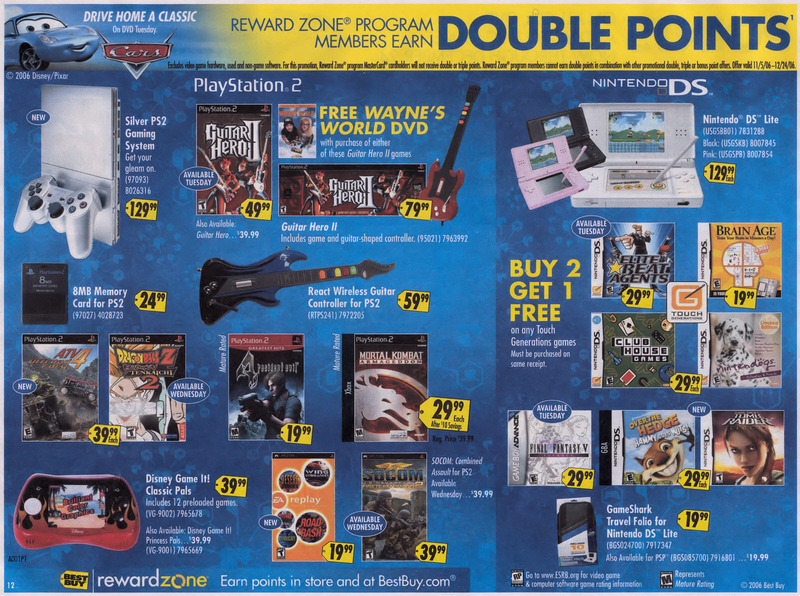 Presumably these codes will also work for the PSP release. 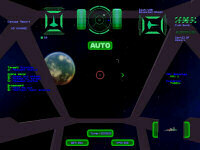 To access the debug menu in Wing Commander: "Press B, A, B, Y, B, Y, L, A, R, A, Start at the title screen. " And in The Secret Missions: "Hold L + Rf + Select + Start on controller two and press Start on controller one at the title screen.". Remember that Wing Commander and The Secret Missions aren't the only Origin games in the EA Relay collection... it also includes the SNES port of Ultima VII! 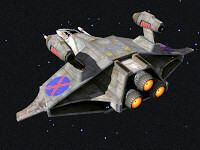 Wing Commander fans know 'The Black Gate' as the Ultima game which includes a Kilrathi Bloodfang fighter. I asked the game's lead developer if the fighter was included in the port... he said that, unfortunately there wasn't enough spare memory to include the image. SNES cartridges strike again! (Read More). Apparently there's a fun in-joke in The Secret Missions -- but it probably won't be possible to access it using EA Replay. Better dig out your Super Nintendos -- here's the instructions, straight from the game's producer: "... we had a pretty funny backdoor in SM. 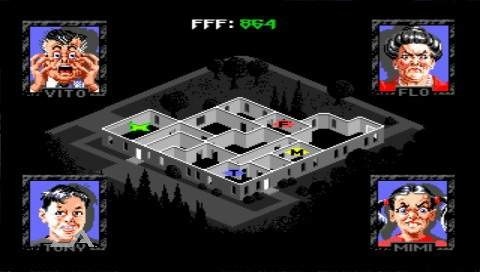 On the title screen press the two shoulder buttons along with the START & SELECT buttons simultaneously and you should see an alternate opening (some of the jokes may be lost on you, as they were specific to the people working at Mindscape at the time.)". Great stuff! That was quite an update! 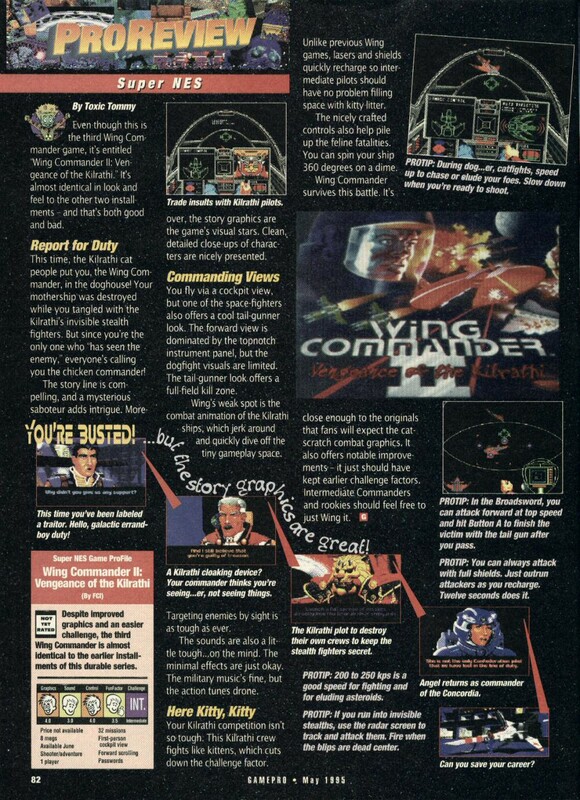 We'll leave you with one final present -- an original Wing Commander SNES advertisement! 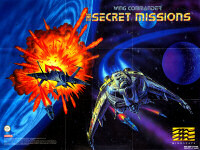 These were published in a media blitz which rivals Wing Commander IV for the largest WC promotion. 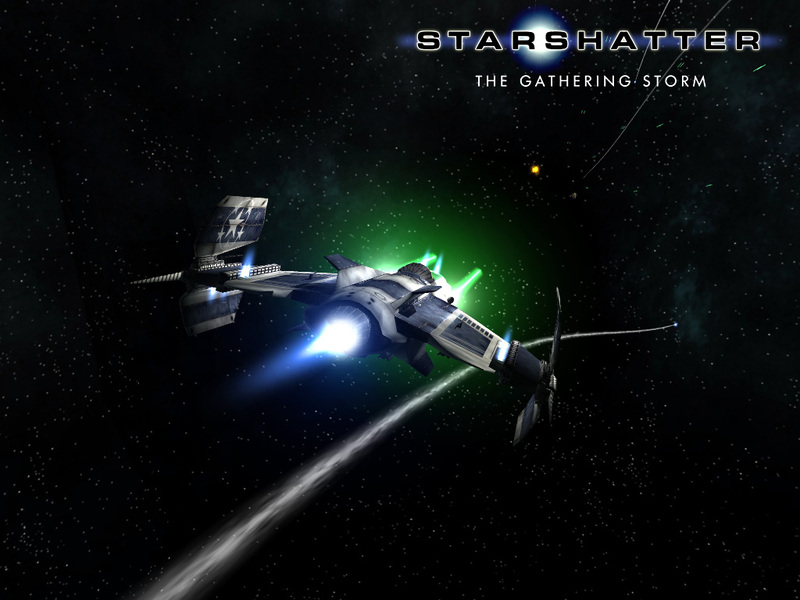 Copies appeared on magazines, comic books and elsewhere to promote the game's release. We hope you've enjoyed this walk through memory lane -- and that you'll enjoy EA Replay... it's certainly what the CIC Staff will be doing! My PSP, entirely unused since its extravagant purchase in September, will soon join Prophecy GBA as part of my everyday kit. When I discuss Wing Commander with passers by, as I often do, I will now be able to flash them the greatest example of the series at a moments notice. Fans can relive the classic wherever they go -- talk to Paladin on the bus, tangle with Krant in the park. What's more, they can show Electronic Arts that there is a strong interest in the series. I dream, hopefully, of a Replay in every pot and two in every garage. As Namco has rebranded Galaga and Pole Position across the world, so too might EA with their set of new classics. 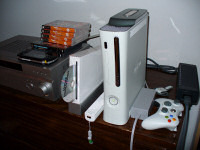 Let us see the package for the 360 Arcade, the Wii Virtual Console, the Nintendo DS and the PS3. Who can help but be amused at the thought of plugging one of those stand-alone game controllers into their television and enjoying Wing Commander? Now, it's your turn -- and it's 9th Grade English class all over again! Simply post to that thread 'What EA Replay means to me'. 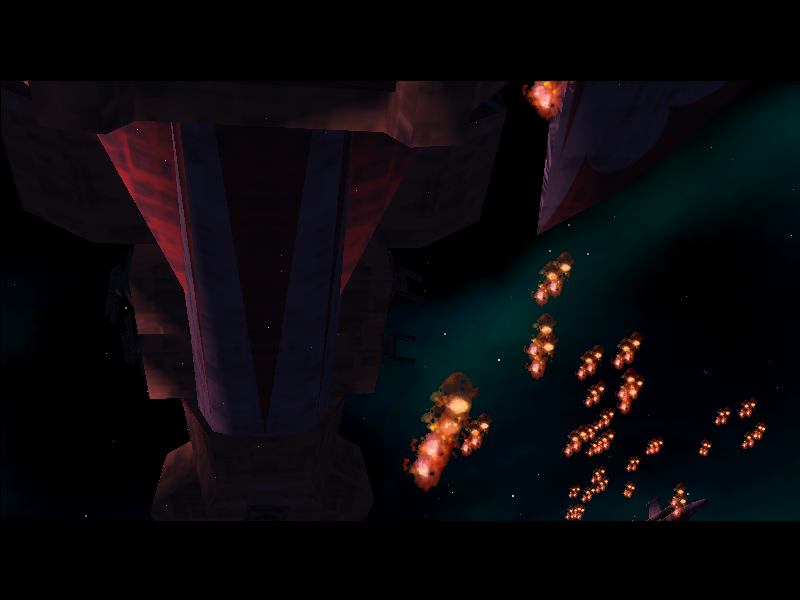 Maybe you believe it's a new hope for the community, maybe it reminds you of the good times you've had with Wing Commander in the past... tell your story! As long as your entry is over 100 coherent words, we'll give you a forums avatar... and, more importantly, the very best entry (as decided by the CIC Staff) will be rewarded with a free copy of EA Replay! Be quick -- you only have twenty four hours! The winning entry will be posted in the news on Wednesday, November 15th. Good luck, pilots! 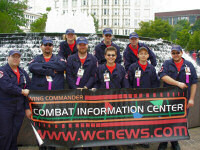 The National Gallery has nothing on us -- at long last, the 2006 CIC Dragon*Con galleries are fully operational! You can see a full ten days of adventure here, as the staff and friends visit Maryland, Washington DC and then Dragon*Con in Atlanta! The pictures have been fully commented by Chris and I, and are a lot of fun. If you're interested in joining us for 2007, you should register immediately -- tickets go from $45 to $50 after Wednesday, November 15th! It's a heck of a time for WingNuts of every sort. Buy them here. 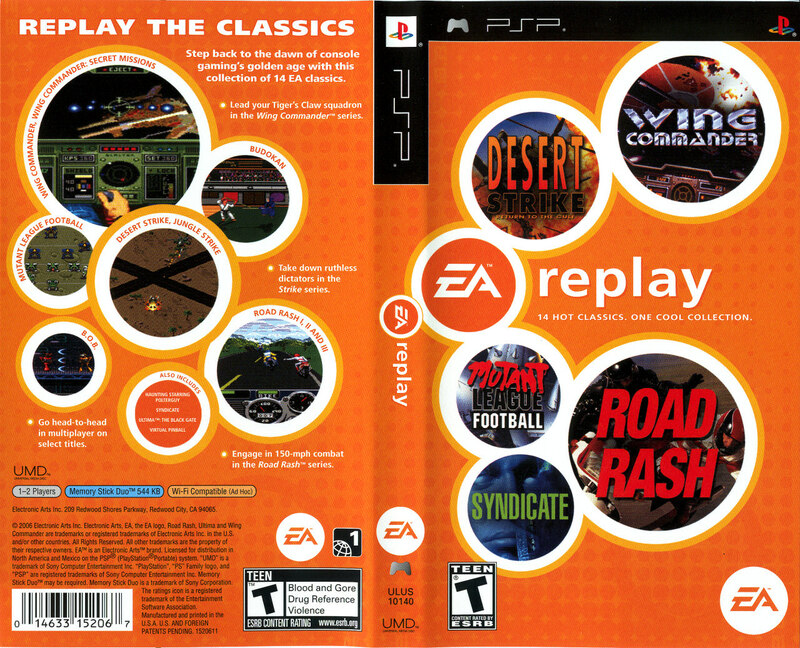 The European Electronic Arts website has released a high resolution version of the Euro box cover for EA Replay. Although the game is not expected in that region for several weeks, it does seem to be on track for a November 14 release in North America. Most stores should receive it on Wednesday or Thursday this week! Alpha 1-1 reports that Toys R Us in Australia has begun advertising the game for about AUS$67 (about US$51), and the tentative release date is December 14. With the UK price being advertised at around £29.99 (about US$57), the American $19.99 price is quite a deal. This number was scaled down from $29.99 early on, and hopefully a similar reduction occurs elsewhere. 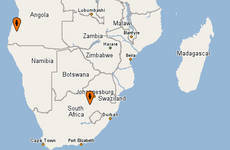 Even if all the current prices hold however, importers are in luck. PSP systems can play games from any region. 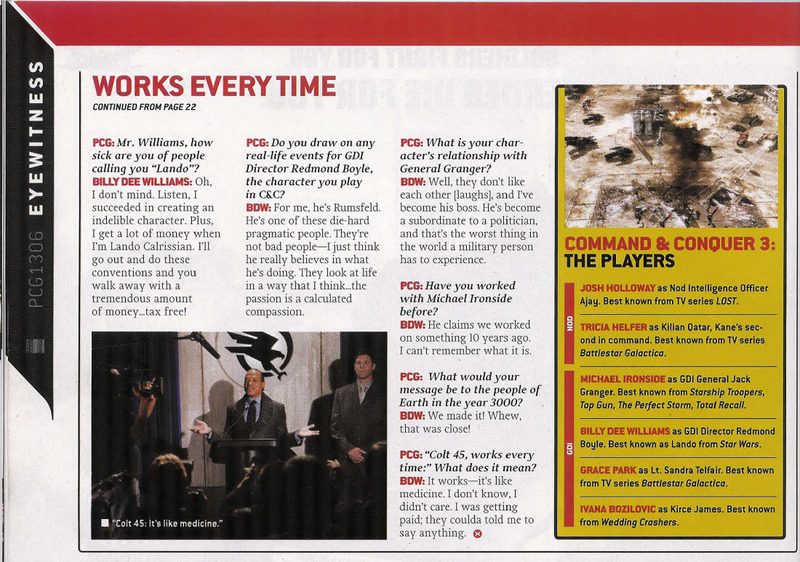 Goku found this interview in the Holiday 2006 issue of PC Gamer. 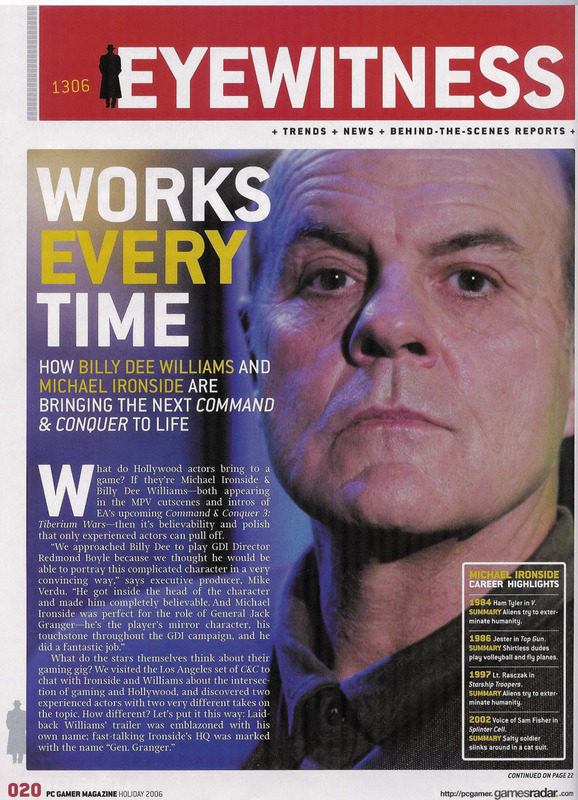 It's a talk with Michael Ironside and Billy Dee Williams about their experience so far with the live video shoot in Command & Conquer 3. The article isn't that long, but there are a couple neat photographs from the physical sets that have been built for filming. 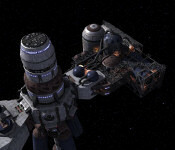 The response to C&C3's FMV cutscenes is likely to have a big impact on the prospects for future games with live actors, so we're all excited to see how things turn out! 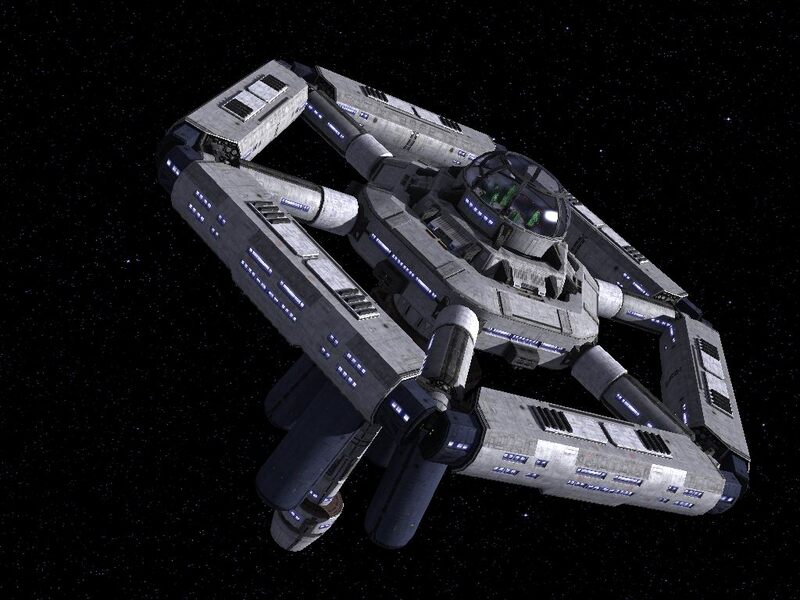 Now that WC Pioneer's space stations are in good shape, Howard Day has sharpened up several of the game's ships that needed attention. 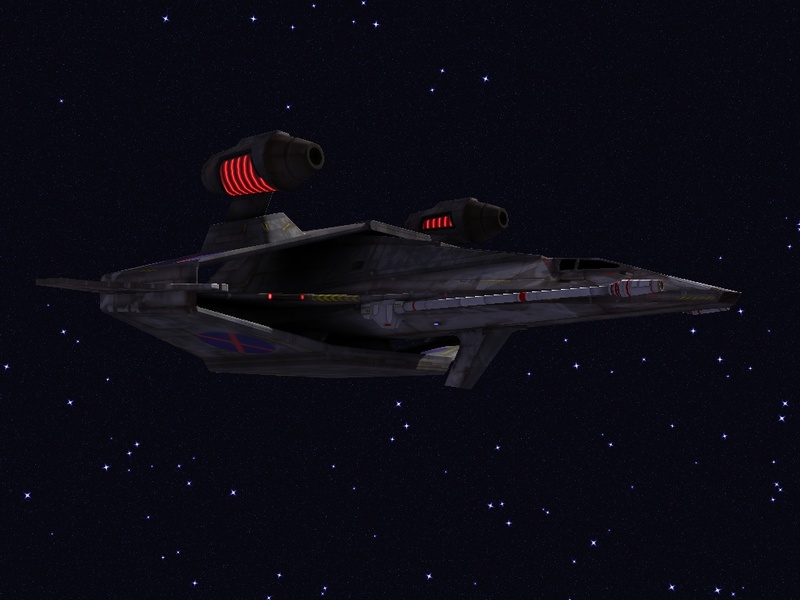 The Scimitar and Tarsus should be pretty familiar to most CIC readers, but the Valiant is a ship Howard made from scratch. 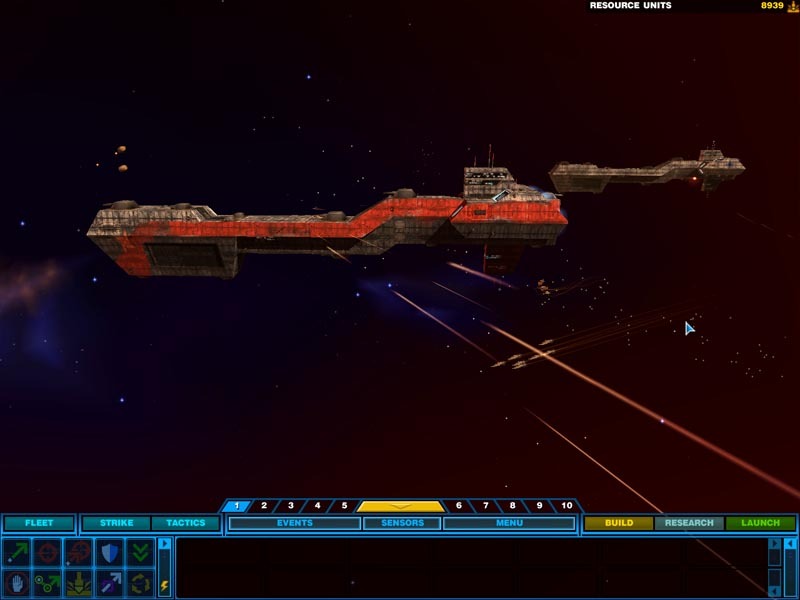 Since the game takes place in the fringes of the Landreich region instead of Confed space, he has spent a considerable amount of time making the ships fit the dilapidated environment. Also pictured below is an updated draft of the nav map that will apply to the area. 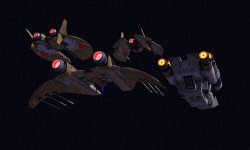 It's a good idea to take care of holiday shopping early, and the Wing Commander movie makes a great cheap gift for everybody. Deep Discount DVD's semiannual sale is a stellar opportunity to pick up extra copies. Using the SUPERSALE discount code, the price drops down to $5.74 with free shipping to boot! The best year-round price I can think of is Fry's $5.99 plus $1.40 shipping. 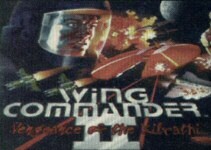 Also, don't forget that Wing Commander is offerred for download via Amazon.com Unboxed for $9.98 purchase or $3.99 rental. 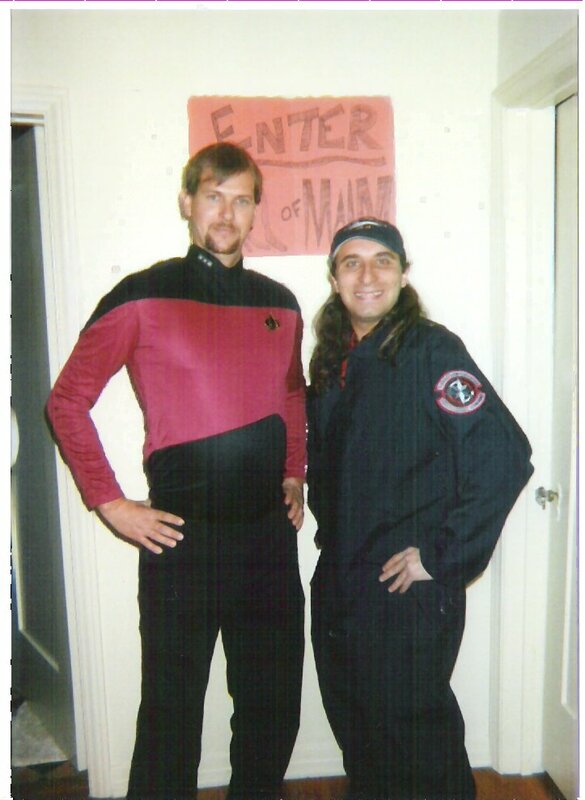 It's been quite a while since we last checked in with Wing Commander and Pilgrim Stars author Peter Telep... and he's been busy! 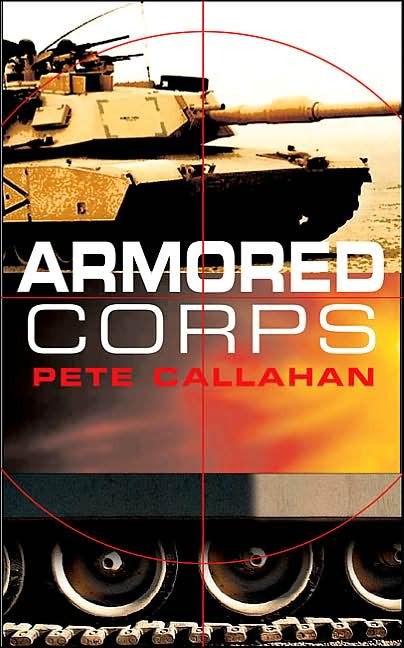 Telep has authored two three-book military fiction series in the last three years... which you may have missed, since he's been writing under the pen names P.W. 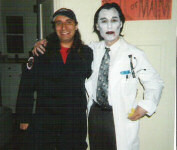 Storm and Pete Callahan. 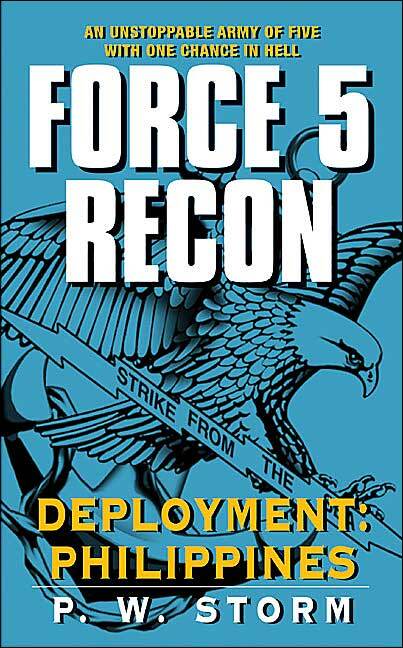 The first series is "Force 5 Recon", which follows the adventures of a modern USMC Force Recon. 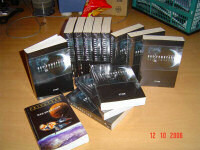 The books are: Deployment: Pakistan, Deployment: North Korea and Deployment: Phillipines. The second is "Armored Corps", which follows an American tank battalion through a possible war between North and South Korea. 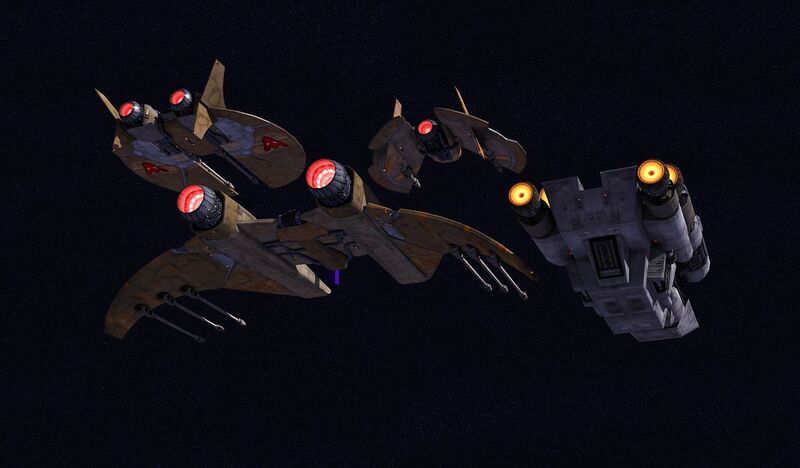 They are: Armored Corps, Engage and Destroy and Attack By Fire. ... but wait, there's more! Telep has two more similar series' in the works. 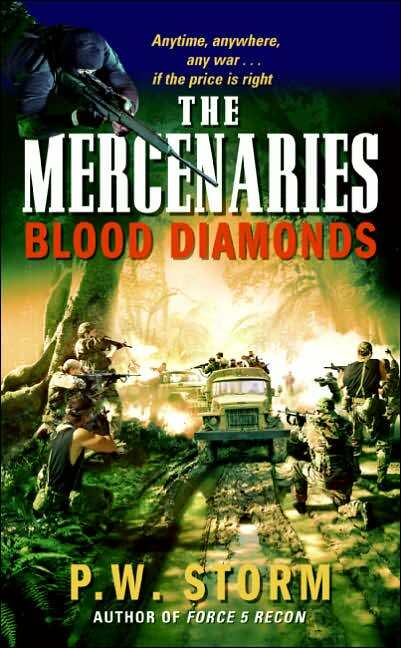 The next is called "The Mercenaries," and the first novel, Blood Diamonds, will be available in December! You can learn about these books and more at his attractive new website here. 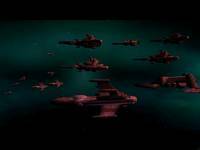 I simply decided to use the Trailer for the Wing Commander movie for this one. For the cast, it goes as follows. I've gotten the video and the enemies shown in all three series will represent the Kilrathi. There will be some parts where the lip sync will be off cue, but it'll be worth it. I've always wondered if you could set the audio to the 1999 movie to the animated characters from the original game -- this seems to indicate that it might turn out well. 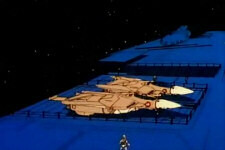 You can download "Macross Commander" here (16.9 mb) in WMV format. There's more from Hudson! 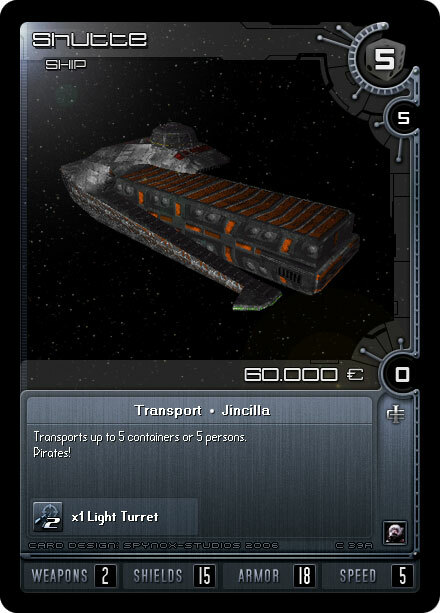 He has posted the next batch of ships for his fan-made Privateer 2 card game project! 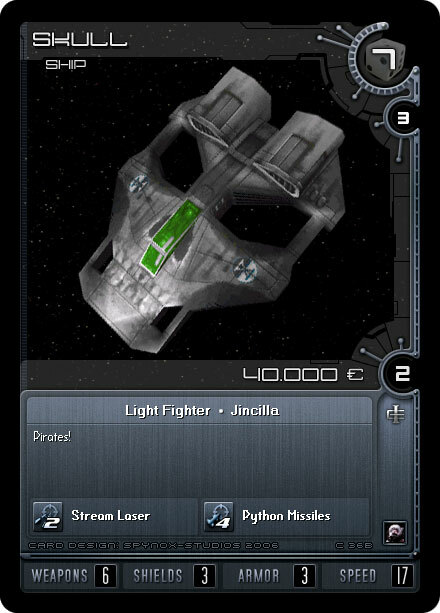 This group includes five CIS capital ships (the MCOS Veldor, MDRE Yackard, CCTB Transport, MCPH Prototype and Previa) and two variants of the aptly named Jincilla SKUL Skull. While the Skull is painfully familiar to Tri-System pilots, the CIS warships may not be -- they appear in the game only as mission-specific objects. 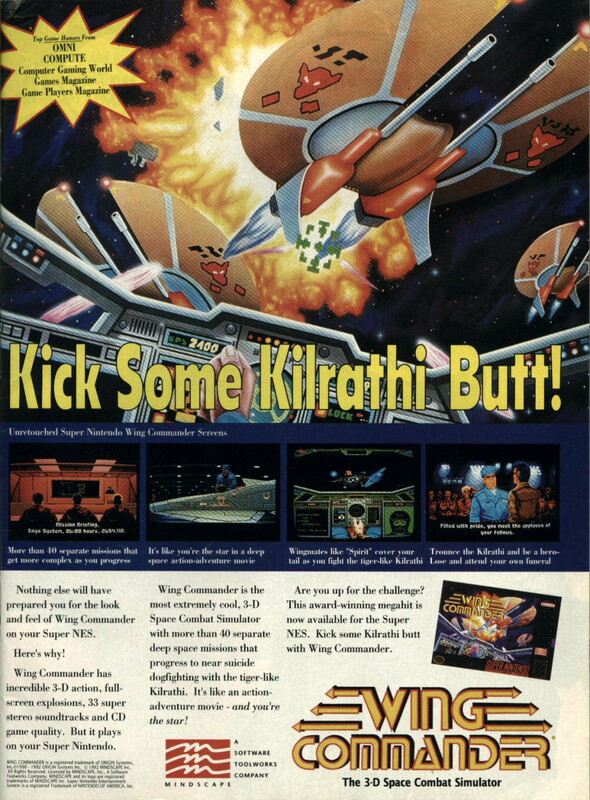 Wing Commander was another popular Space combat simulation franchise that maintained a healthy level of popularity for quite some time, though the ill-fated movie of the same name (released in 1999) quite probably sealed it’s demise. The brainchild of Chris Roberts (who also went on to direct the above mentioned ill-fated movie), the Wing Commander phenomenon kicked off in 1990 with the first title, simply called Wing Commander. 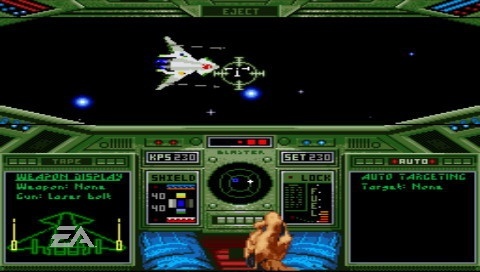 It wasn’t a full 3D game, but was a passable sprite-based representation of 3D to be referred to as 2 and a half D. Graphically speaking, Wing Commander was worlds apart from Elite and was popular enough to be followed up by Wing Commander II: Vengeance of the Kilrathi, which continued the adventure by adding a few welcome plot twists. 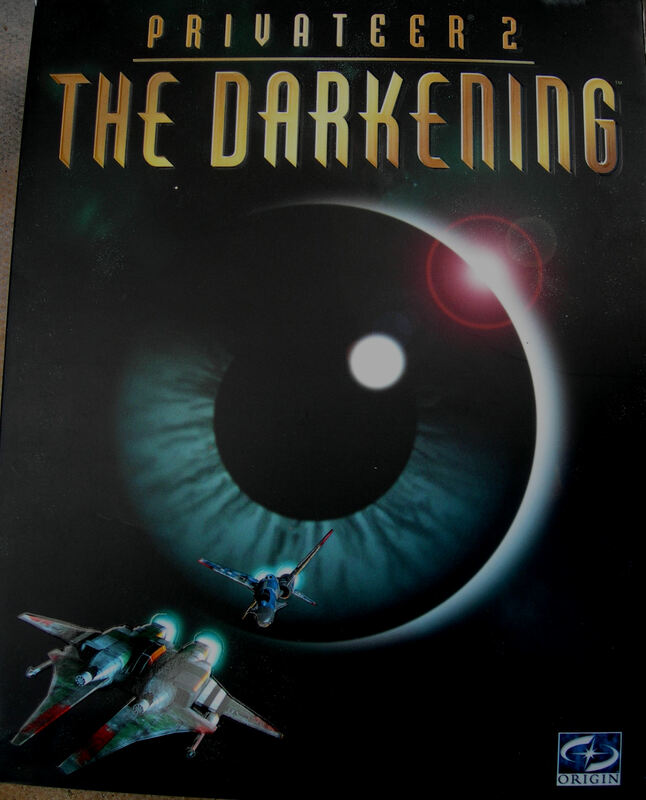 A few years later the third installment was released, giving us the first real insight into Chris Roberts desire to fuse cinema and computer games. The 4 CD set contained over 3 hours of live action video footage starring actors such as Mark Hamill and Malcom McDowell. Featuring over fifty missions, offering multiple endings and powered by a new 3D engine, Wing Commander III: Armada went on to win numerous game of the year awards, despite facing some serious competition from LucasArts and Totally Games. The franchise pushed on with the release of Privateer (loosely based around the Wing Commander universe, but with less emphasis on dogfighting and more towards exploration, traveling and trading) in the same year. 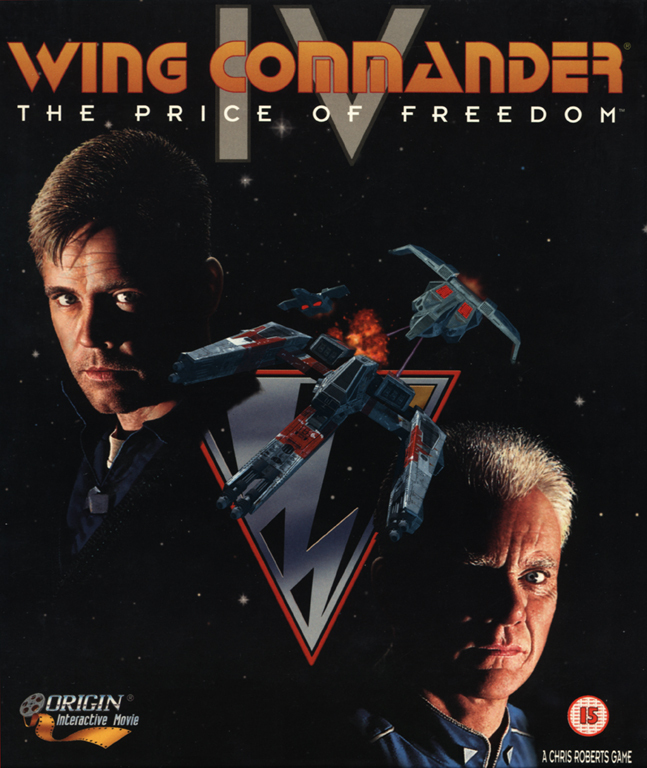 Wing Commander 4 was released in 1995 with a massive development budget (for the time) of 10 million, which was largely due to the continued use of copious cinematic cut scenes to convey the epic storyline as it unfolded. 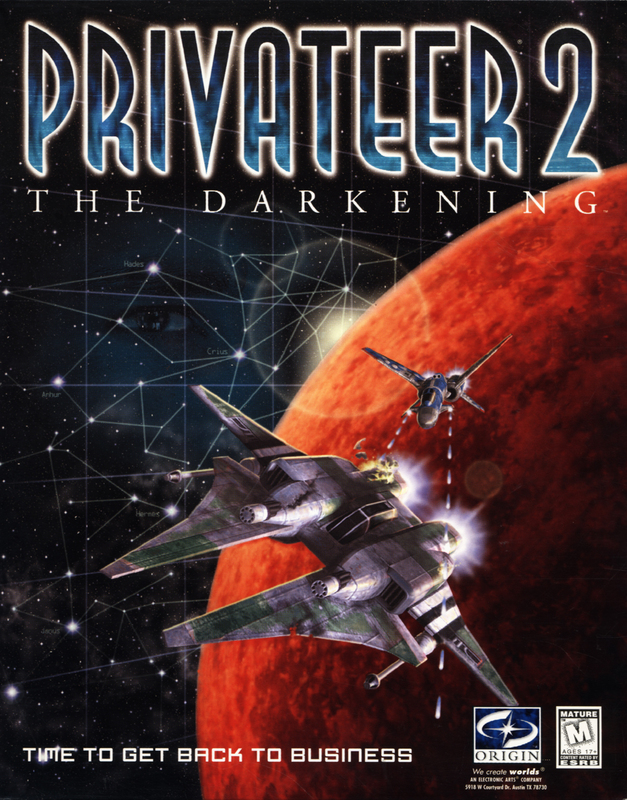 Released in 1996, Privateer 2: The Darkening is one space combat simulation that also rates a mention, though unlike Privateer, bore no relationship to Wing Commander at all. 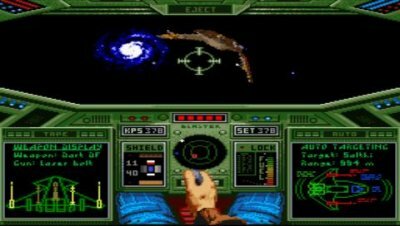 Like Privateer, however, it was a heavily story-driven game that also focused game play around travel, trading and exploration. 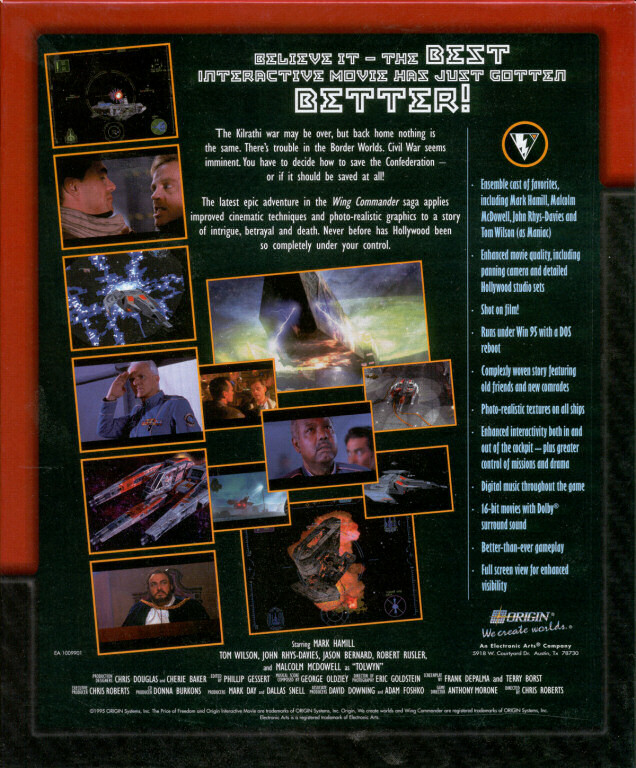 Similarly to the Wing Commander series, Privateer 2 featured a lot of cinematic sequences to deliver the twisting plotline as the game progressed. 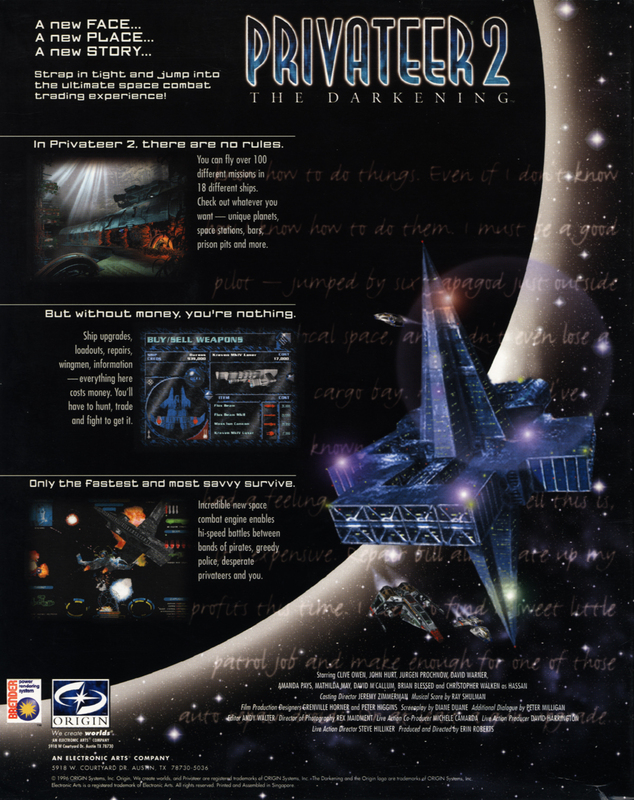 For those keeping score at home: 1) One development of Privateer Online occured well after the release of the movie, and two Wing Commander ports have been published since its release. 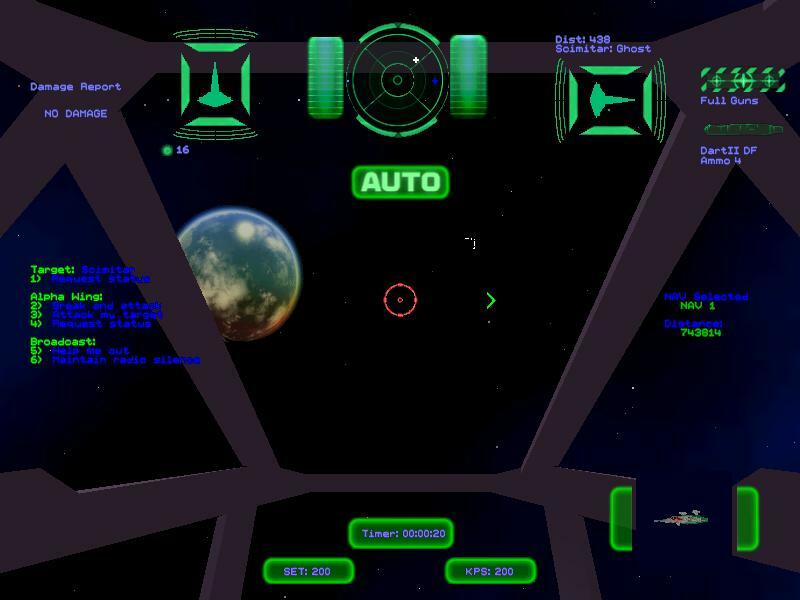 2) Wing Commander III did not feature a new 3D engine, it used the RealSpace system developed for Strike Commander and also used in Armada. 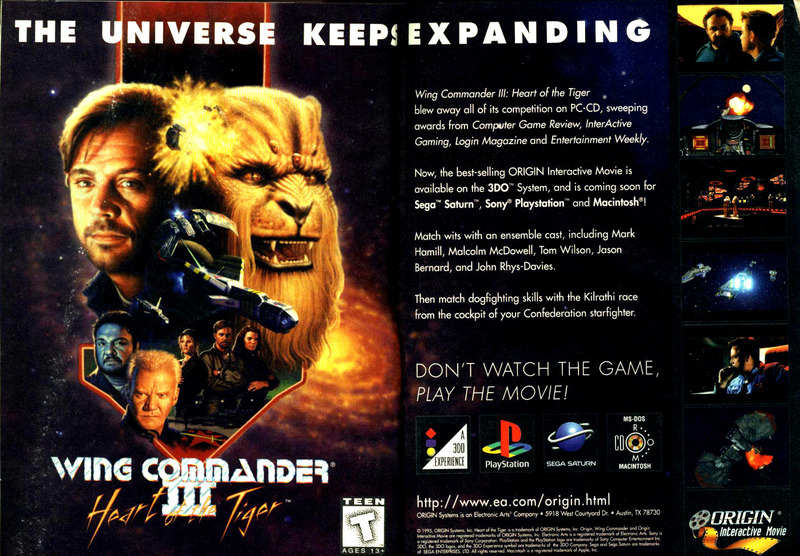 3) Wing Commander III's title was "Heart of the Tiger", not "Armada". 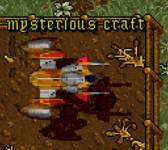 3) Privateer came out before WC3, not after. 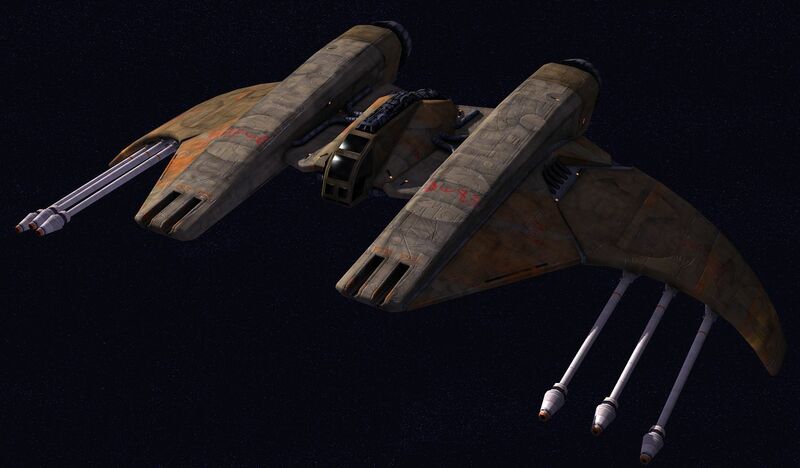 4) Wing Commander IV's budget was $14 million, not $10 million. 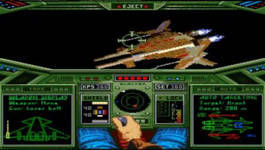 5) Privateer 2 has several connections to Wing Commander, including being the sequel to Privateer. Whew. 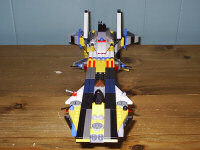 Hudson has made a new set of clothes for the ML01 Duress light fighter. 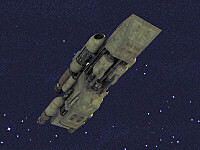 The Duress is one of eighteen flyable ships in Privateer 2: The Darkening. Hudson has previously done artwork for The Awakening (a fan novel) and its spinoff card game. 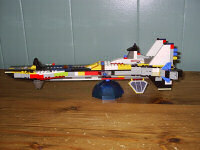 You can find a step by step guide to how he updated this fighter here. 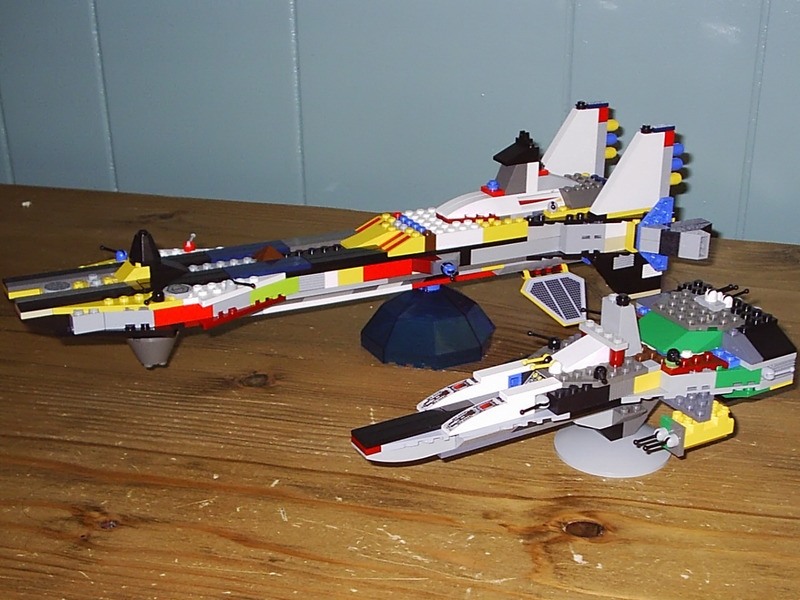 The new version is on the left, the original on the right. Boo! 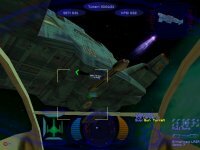 Electronic Arts has released another set of screenshots from EA Replay... but, once again, they aren't from Wing Commander. 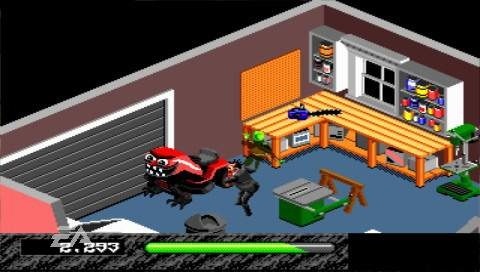 These images come from "Haunter Starring Polterguy", a 1993 Sega Genesis game. Haunter is a much more obscure game than the others in the set, perhaps giving hope for those interested in seeing reissues of some of EA's less popular classic titles. Nevertheless, that's one scary... evil tractor? All available screenshots have been collected here. 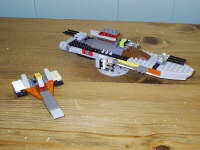 Seth Brice has commissioned several new ships for his Lego fleet. 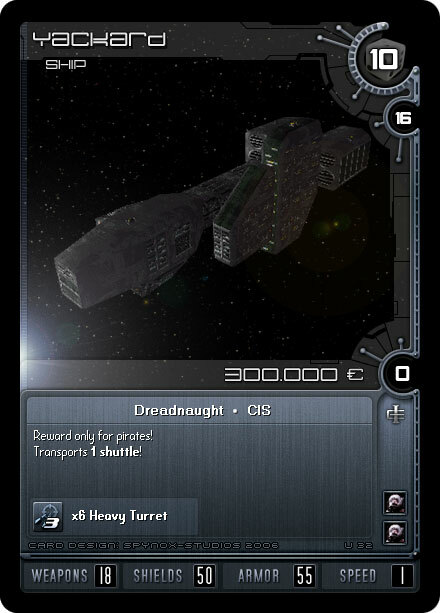 The biggest new addition is the Confederation class dreadnought. 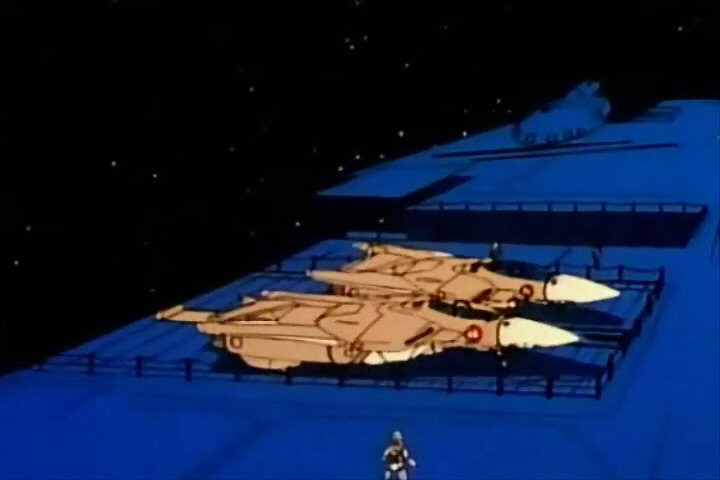 It's cruising next to a Bengal class strike carrier in the first shot below. 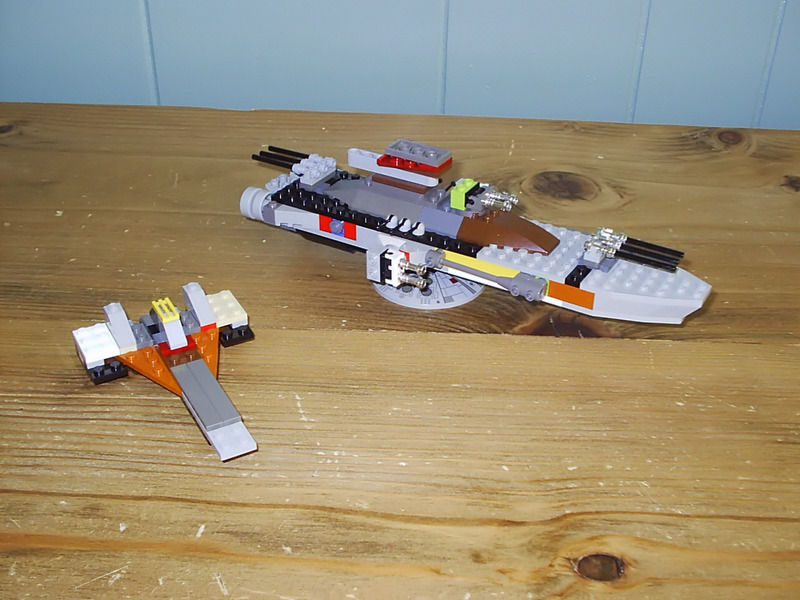 A Gilgamesh class destroyer and light cruiser similar to the TCS Manassas are also depicted (but not to scale). The final ship is a Kilrathi dreadnought inspired by the Agon Ra Sivar. 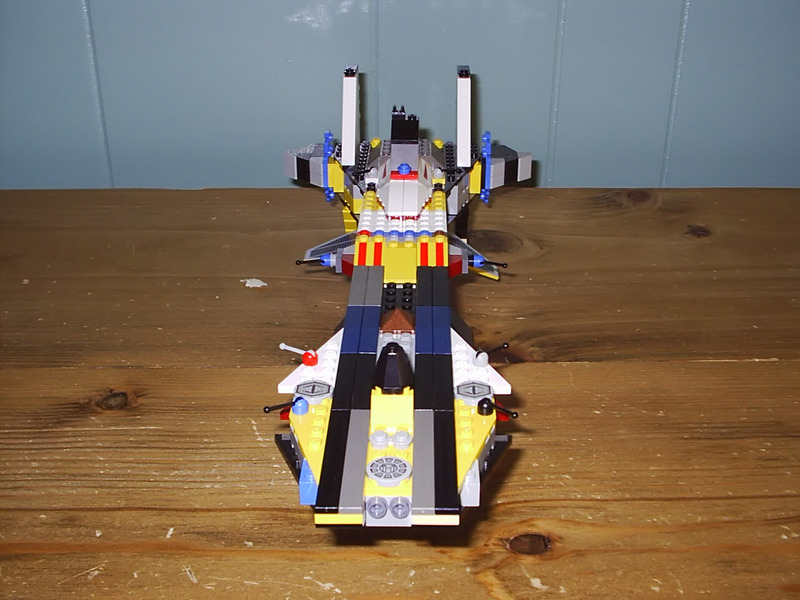 Although the colors are a bit wacky, the general structures are surprisingly accurate on some of these ships. 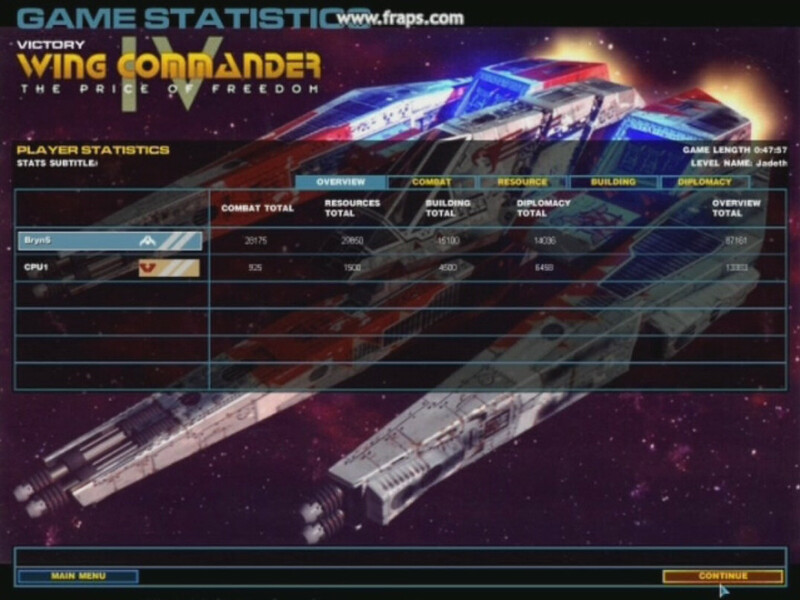 It's worth noting that Seth hasn't even played Wing Commander 2. 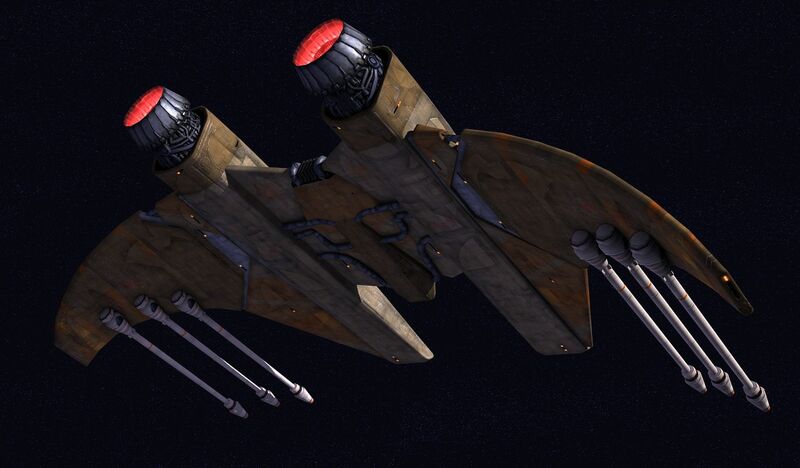 The Confed dreadnought design is based entirely on various images he was able to find. As we get closer to the release of Windows Vista, more people have been asking whether or not they'll be able to play their classic Wing Commander games on the new operating system. Current Windows users may or may not be eager to upgrade, but those who do should not have to worry about losing the ability to play their classic games. There's been mostly good news for Wingnuts when it comes to backwards compatibility. 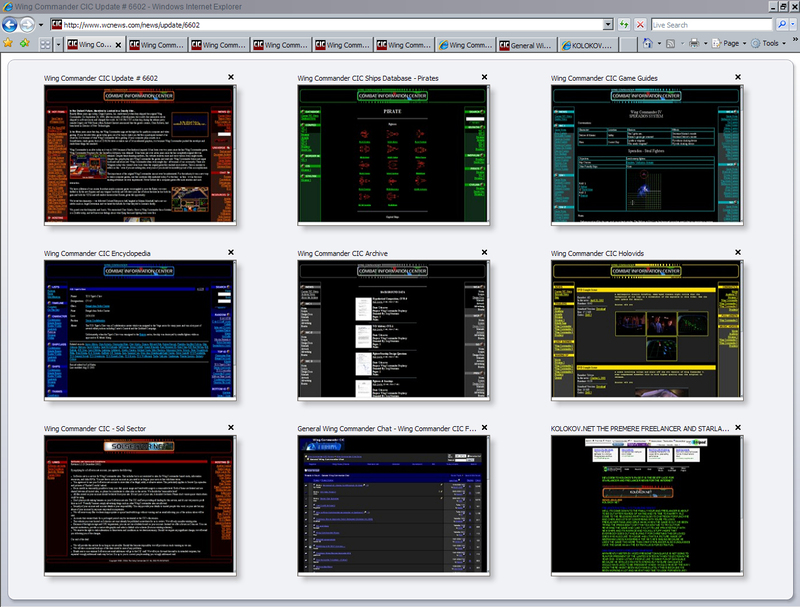 Our preliminary testing shows that almost the entire series can be played in Vista in one form or another. We're optimistic because our tests were done on a older beta version of the OS, and methods for emulating old systems have been making drastic improvements over the last few years. DOSBox works well on Vista, and all original DOS Wing Commander games will play in it. WC games that were designed for Windows will still need compatibility mode enabled, and that will still be accessible by right-clicking programs' main executable files. 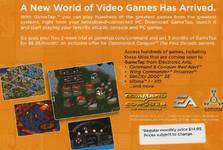 As more Origin titles are released for GameTap, they will also undoubtedly be playable within Vista. And when all that doesn't work, there's always the Crius.net Tech Support Forum. 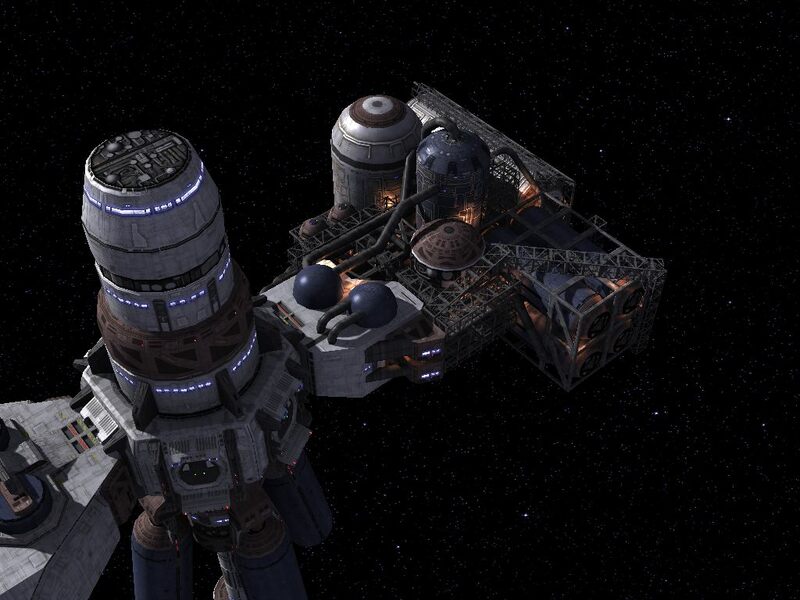 Howard Day has completed his planned modules for a general station in the WC Pioneer fan project. 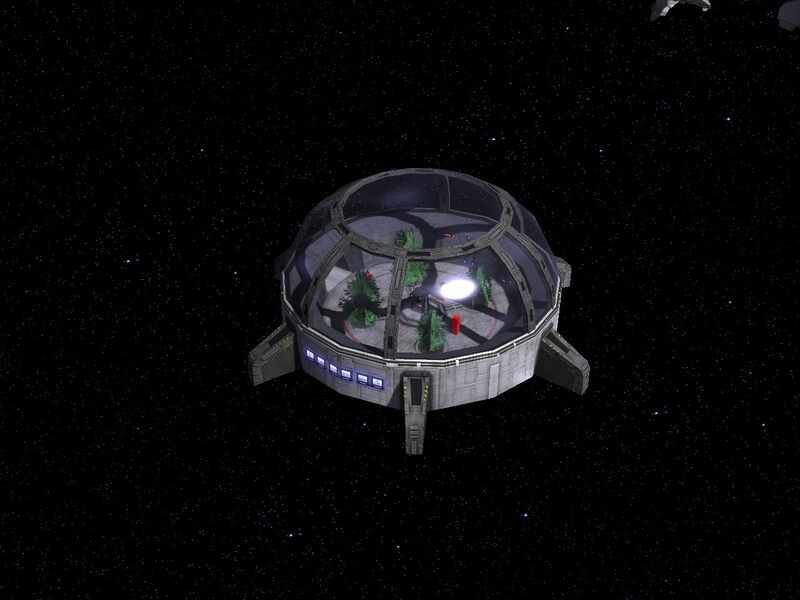 The prominent habitant ring was the last primary feature he was working on, and all of the various components have now been nicely textured. 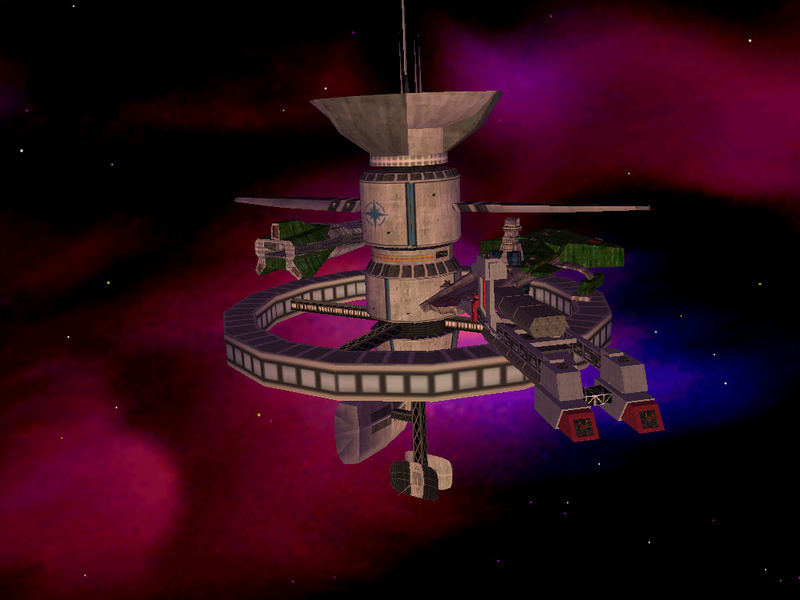 Sharper looking hangar bays and refinery areas are visible below, and a familiar old mission computer sits in the center of the transparent dome element. 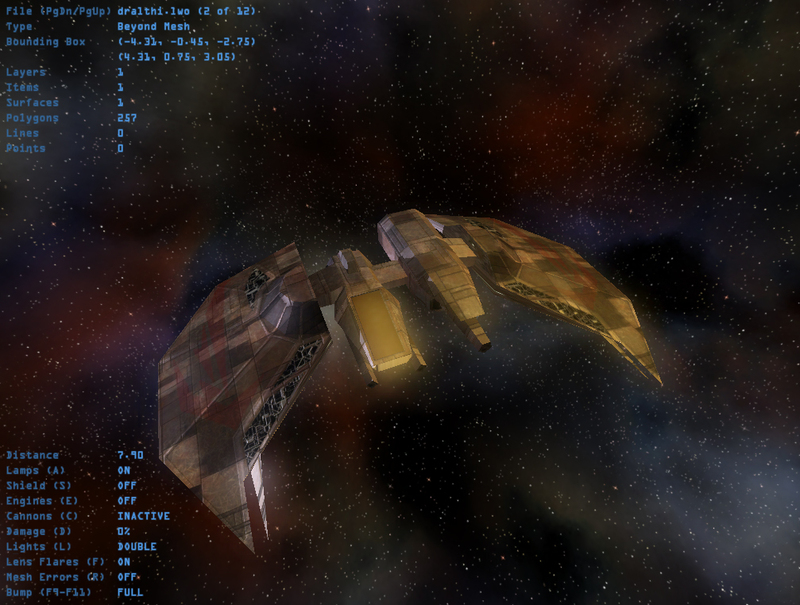 Howard is now moving on to art for space backgrounds and various menus and interfaces. You can find more model shots at Crius.net. 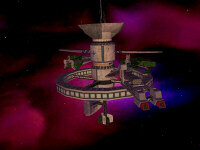 Alrighty - finished the last module for a while - the habitat ring. 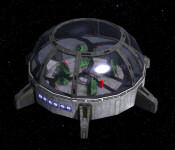 This is designed to partially mimic the supply depot from WC2. Without all the green, obviously. So feedback is appreciated, but I can't guarantee when any feedback would be put into effect. Been lots of fun, guys! In a similar fashion to last month's CNN article, the UK's Times Online has written an article on the 'episodic gaming' trend. The piece discusses some of the background and reason why companies are interested in dividing games into chunks, and it mentions Secret Ops as a pioneer of the concept. What is left up to speculation is whether audiences will pay for the experience, but I think the genre has already seen enough success for it to happily coexist with traditional games in the foreseeable future. You can check out the full article here. 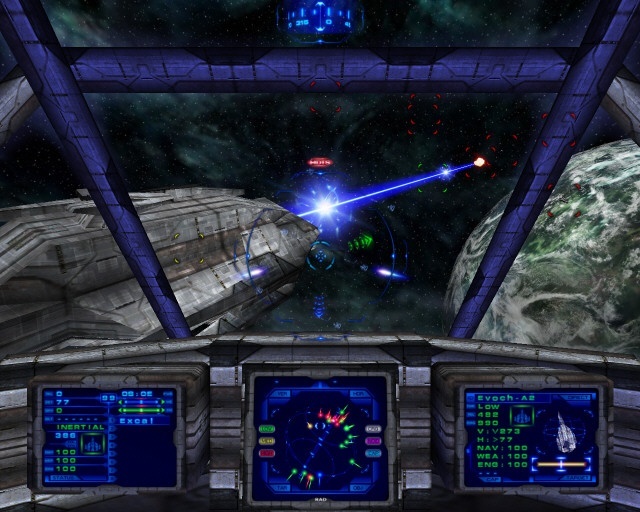 Episodic gaming has lurked in the shadows for almost a decade, with Electronic Arts among the first companies to offer online updates to titles such as Wing Commander. But now, with development costs rising ever higher and broadband penetration widening the online marketplace, more mainstream developers are endorsing the model. 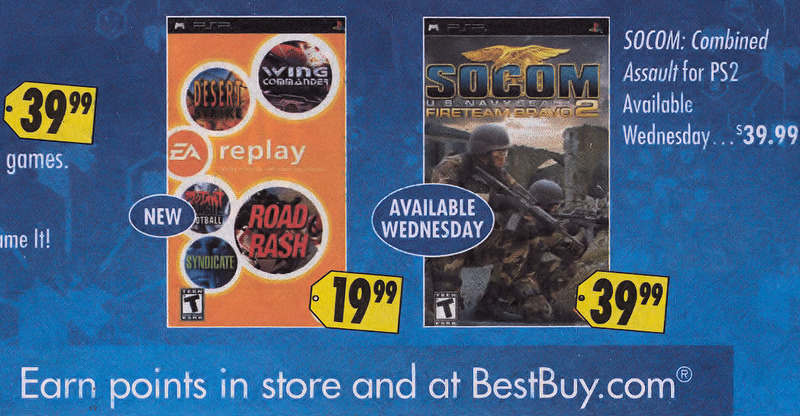 Zor Prime tipped us off about the first print advertisement for EA Replay. 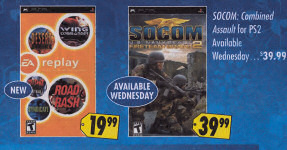 The game is featured on page 12 of the November 5 Best Buy circular. Text next to the box says "NEW," which suggests that the ad was designed when the game was scheduled for an earlier release. Best Buy's website has added a product listing with an updated release date of November 16. This is in line with their typical practice of adding two days to the ship date for medium size titles like Replay. It's getting closer! 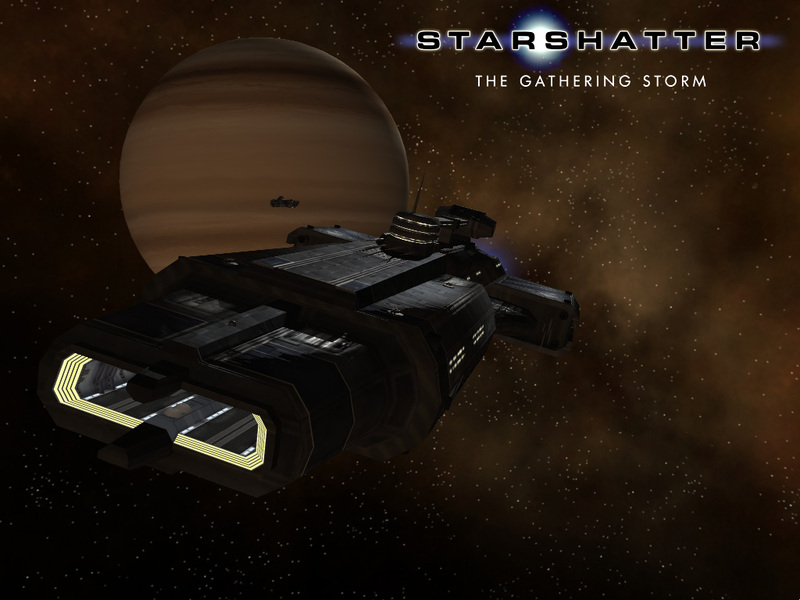 Starshatter: The Gathering Storm is an enhanced release of the original Starshatter. The game has been bolstered with upgraded engine graphics, music, animations and more. 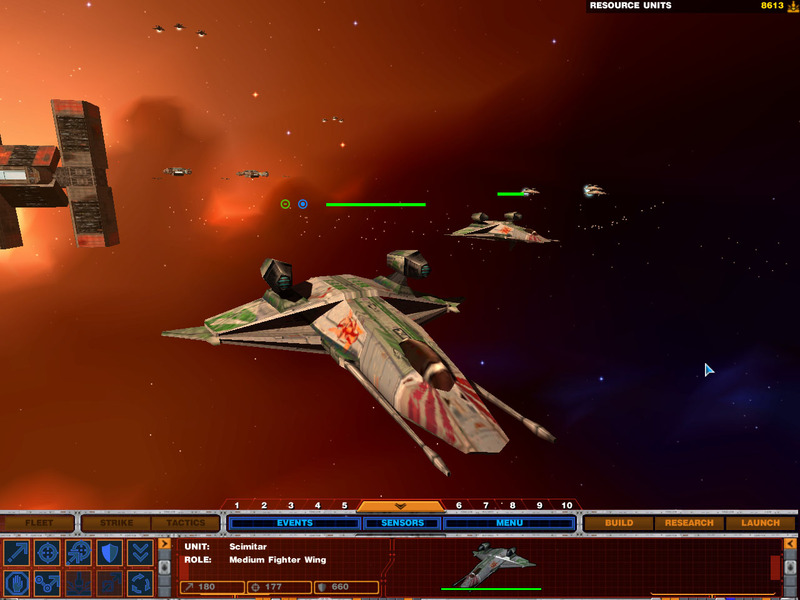 Players have the choice of becoming either a fighter pilot or small capship commander, and the size, strength and number of ships under their command grows throughout the game. 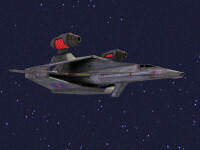 Smaller craft can fight both in space or planetary atmospheres, and numerous different control schemes and physics models have been implemented to provide different methods of flight control. 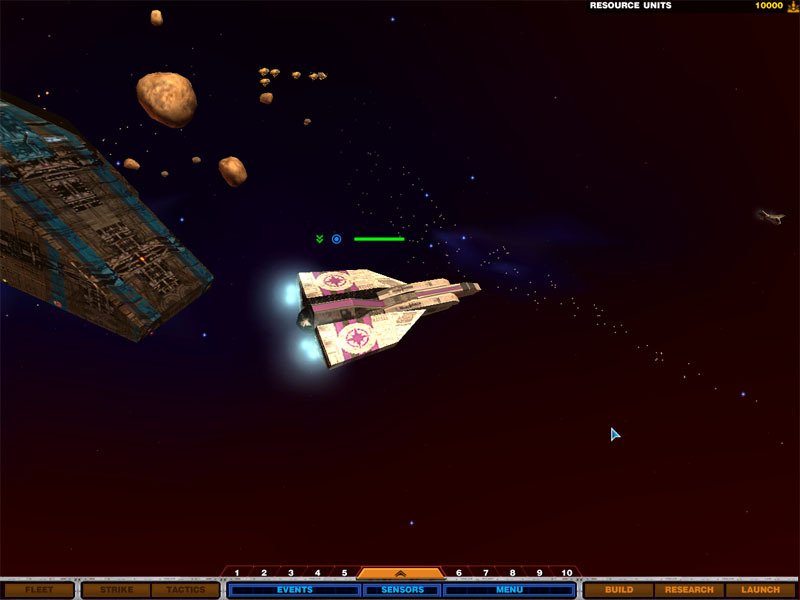 Parts of the game are comparable to light RTS titles due to the large scale nature of fleet combat, and the game tries to integrate fighter and starship combat throughout. Another cool feature is support for the NaturalPoint Head Tracker that syncs your onscreen view with the direction your head is pointed during flight. 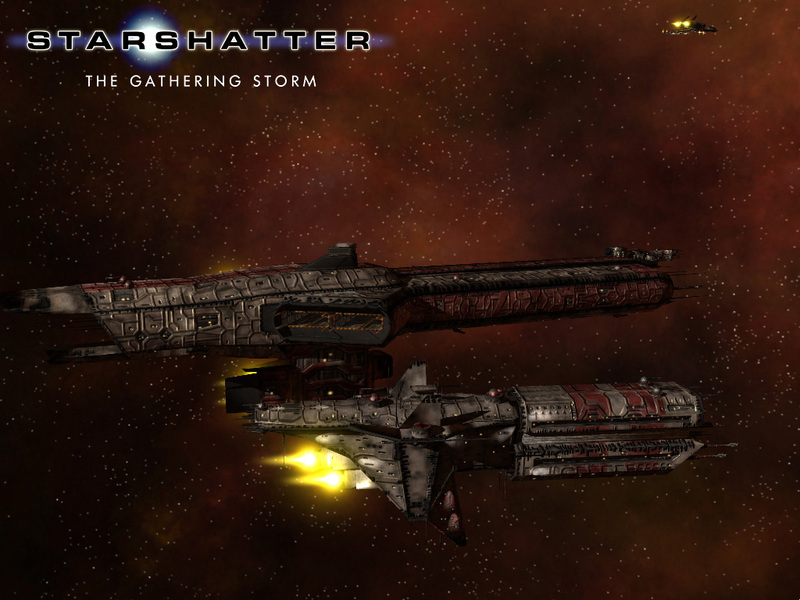 Starshatter TGS has gone gold and should be available by the end of the year. Here's a peek at the direction Gemini Gold would like to go with bartenders. 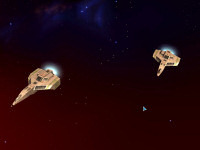 John Cordell created the first shot as a visual upgrade example. 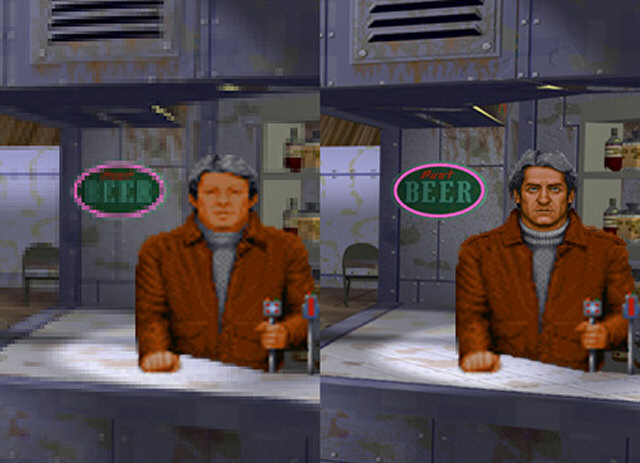 Privateer fans will notice that the higher quality talking head has been transplanted from conversation sequences in the original. 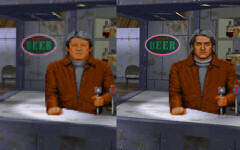 The second image shows an actual update to the project using a recreated animation. Although he's lost a little weight in the conversion, the character still fits in with the Privateer crowd and the higher resolution Gold scene. 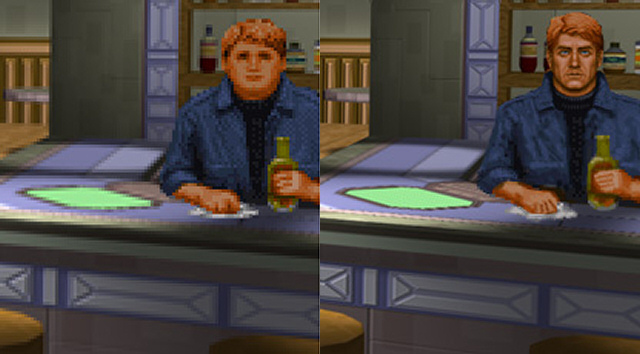 As a test I took the agricultural bartender (easy animation) and tried to repaint the different frames at a higher resolution. It's definitely a tough job and very time consuming. There's a new Internet Explorer out, and it includes a nifty way to browse the CIC. Check out this pretty picture see some of our different sections in the Quick Tab layout. We're not quite up to 31 Flavors yet, but we're working on it.. Exciting news for collectors! 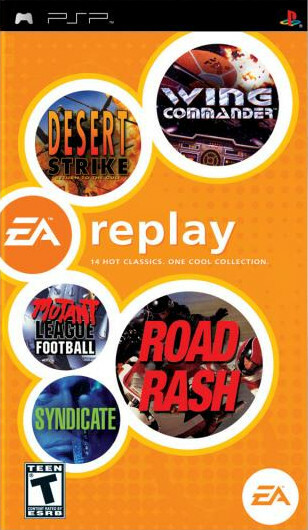 Amazon UK has posted the British artwork for EA Replay, and it's different... sort of. Compare the two images below: the UK release is on the left, the American is on the right. Somewhere, someone is actually being given a salary to move the EA Replay bubbles around. 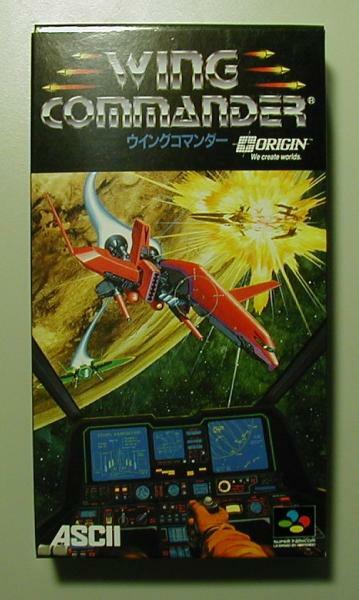 Who knows what the Japanese version will look like -- maybe the Wing Commander circle will be at the bottom! 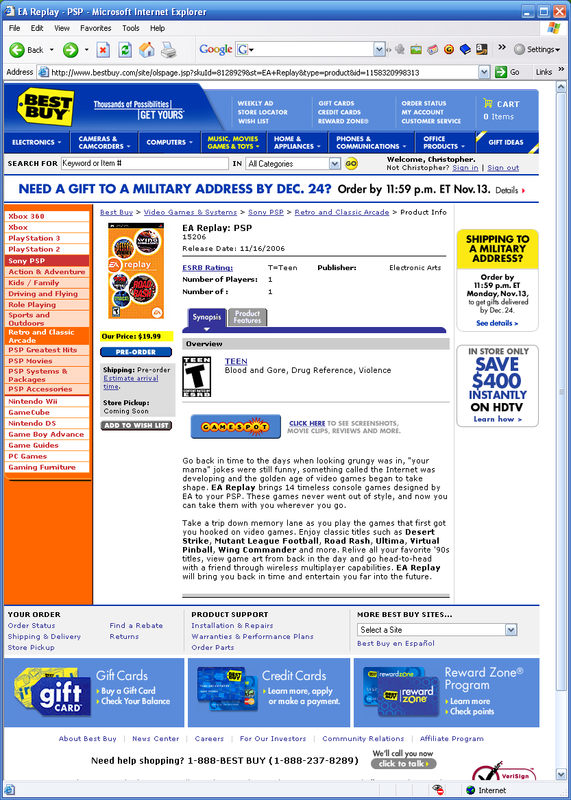 EA Downloader, which launched last November with Battlefield 2 and Sims 2 expansions, has been replaced with EA Link. The enhanced service offers demos, trailers, wallpapers, patches and complete games for download online. EA Link will also make it easier to buy content by supporting preexisting services like PayPal. Many comparisons have been drawn between Link and XBox Live Marketplace, and it sounds like the service was inspired by Electronic Arts' success there so far. The new system already has the 2007 versions of Tiger Woods, FIFA, NBA Live, NHL, Sims 2, Battlefield 2142 and more available for direct download. GameSpot has posted an interview with EA's vice president of online commerce that gives readers an idea about where the service might go in the future. It sounds like there is a lot of potential here for fans of Origin games. GS: So as of now there are no current plans to charge for microtransactions for PC content? CL: No, there aren't plans to that scale. 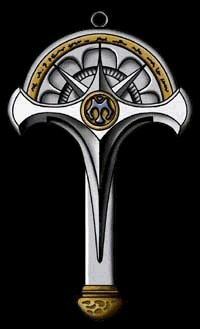 We do have microtransaction content available for Ultima Online, and that's something that our customers love. We put little bits and pieces out here and there. 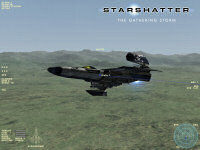 But no, certainly not to the scale that you're looking at it, at something like Xbox Marketplace. 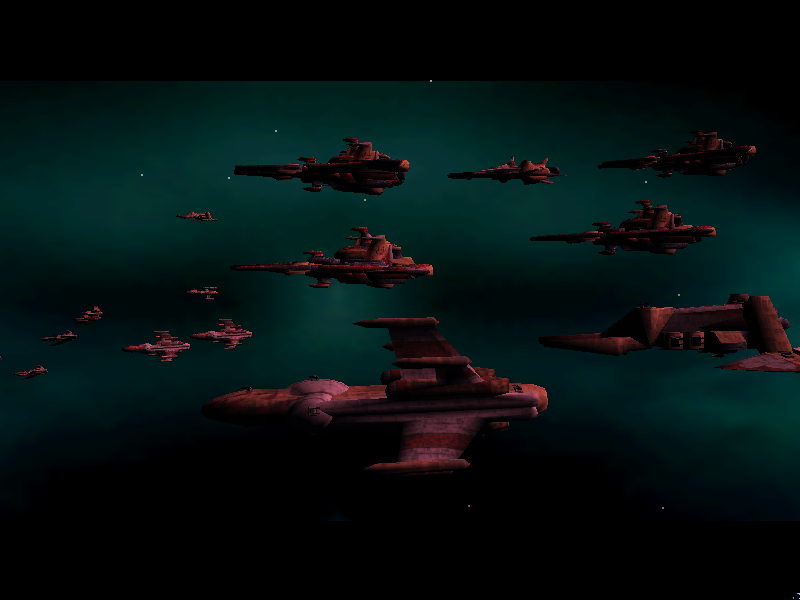 Aaron recently took his assets from the WC4 Homeworld 2 mod and tried something slightly different. 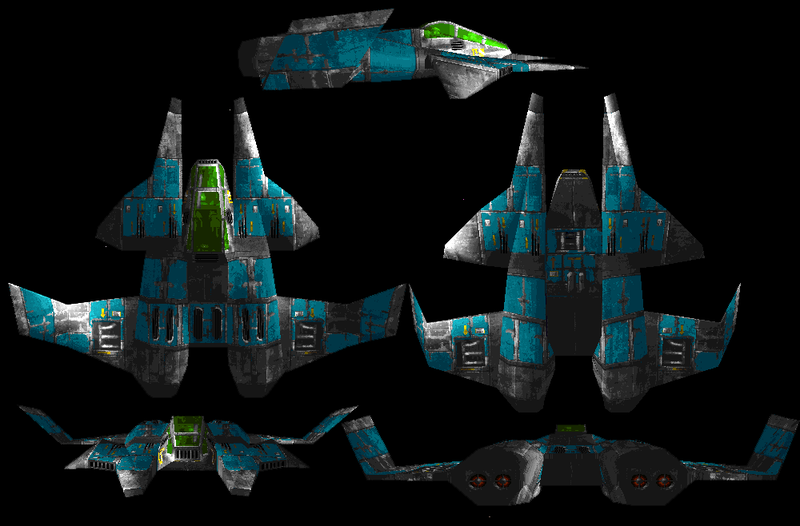 He's given a handful of the project's fighters their original Wing Commander 3 textures to see how they look. The change is subtle at a distance, but these war-era paint schemes are bold and distinctive up close. 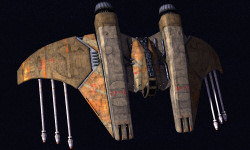 It can be easy to overlook the unique visual details given to each iteration of a craft in Wing Commander, but the series has a long history of creatively redecorating its ships. 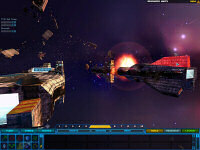 Check out Crius.net here for more images and commentary. Here's a little treat. 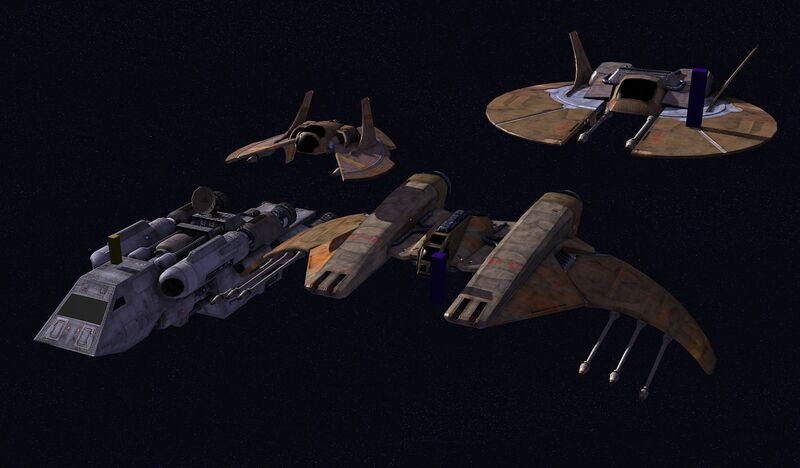 Everyone please note the pictures you see below have been made just for fun and to see what these ships look like in the HW2 engine. 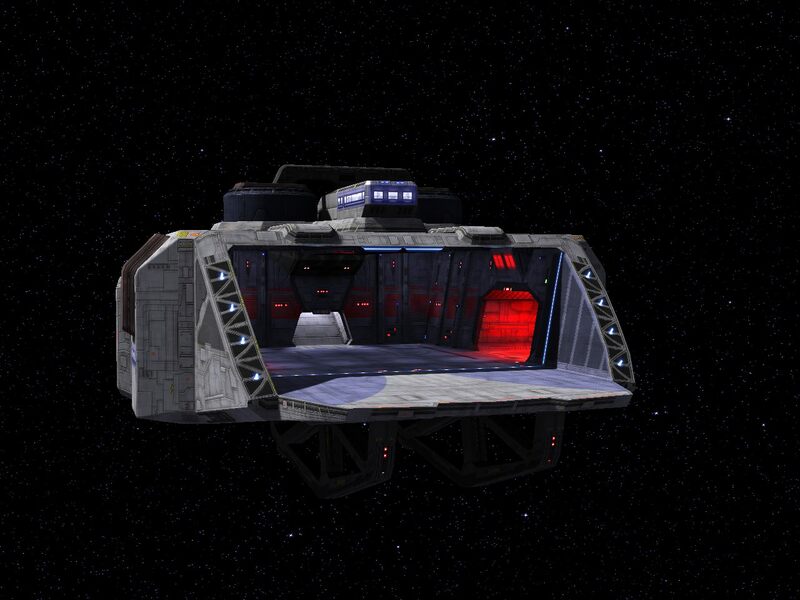 Since I had the models ready, I went ahead and just changed the textures. I am not working on a WC3 mod right now, no such plans until I finish the WC4 Mod. Electronic Arts has announced its Second Quarter (2007 Fiscal Year) results, and the numbers are pretty impressive. For July, August and September, the company's revenue increased 16% to a record $784 million. Almost a quarter of that total came from the relatively new XBox 360, and the company is preparing numerous titles for the upcoming Playstation 3 and Nintendo Wii. Madden 2007 is the best selling game of the year so far with five million copies sold in the title's first five weeks in stores. EA has almost a thousand more employees now than it did a year ago, and the company is sitting on more than $2 billion in liquid assets to finance future development. During today's stockholder conference call, EA also announced a number of new titles including The Sims 3 and Sim City 5. PC game sales now account for about 11% of EA's revenue, compared with 8% for the PSP or 4% from cellphone games. "We are well prepared for the holidays on all platforms, including the Xbox 360, PLAYSTATION 3 and the Nintendo Wii," said Larry Probst, Chairman and Chief Executive Officer. "In the quarter, we plan to release eight titles across multiple platforms and currently have more than 30 next-generation games in development." 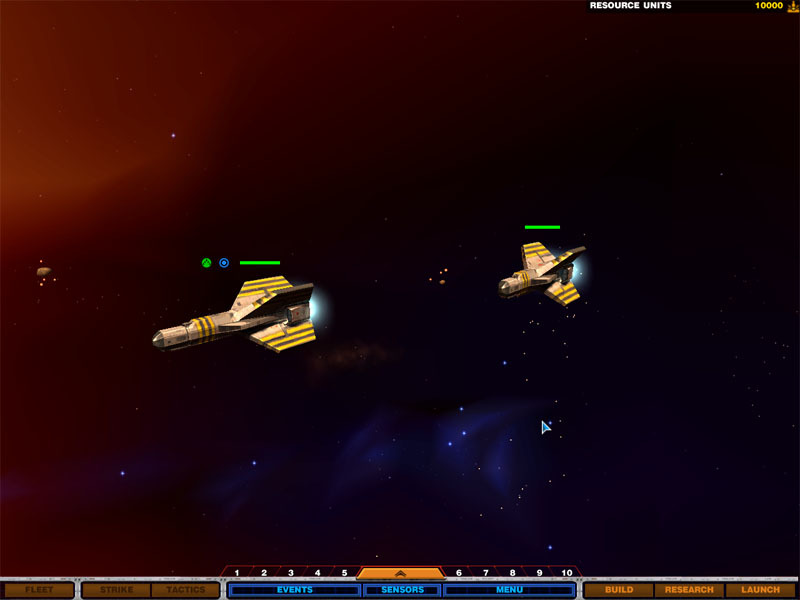 Marc has used his graphical talents to help spice up the Gemini Gold project. 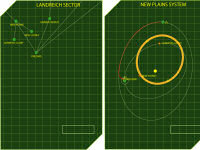 He's taken the original Gemini Sector area maps and redrawn them with more detail. Off the top of your head, can you still name all four quadrants in Gemini? Those simple dots and lines have a lot of character to them and represent vivid memories for many Wingnuts. The original Software Booth is also visible below. 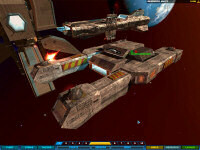 Front page updates aren't the only place to get Wing Commander maps. The CIC has a comprehensive Universe Maps section to help guide Wing Commander fans to where they need to go. 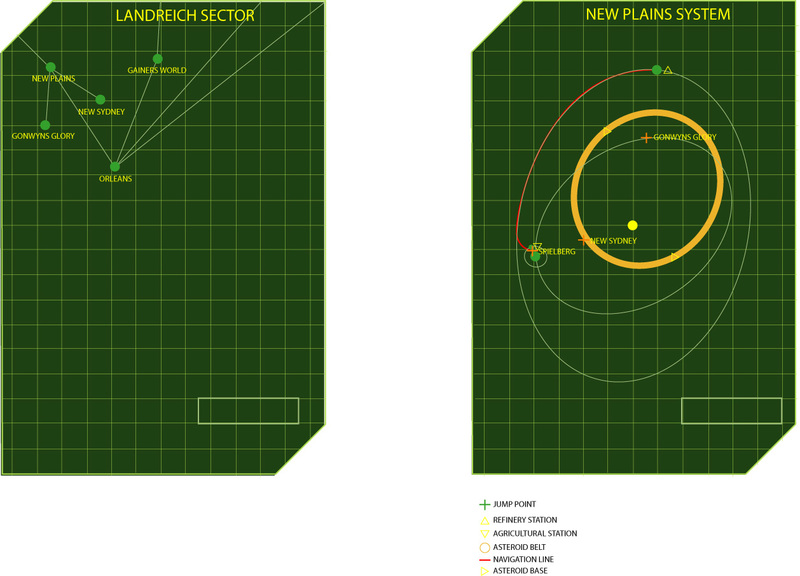 At the top of the section is a standardized look at the area around and between Earth and Kilrah. 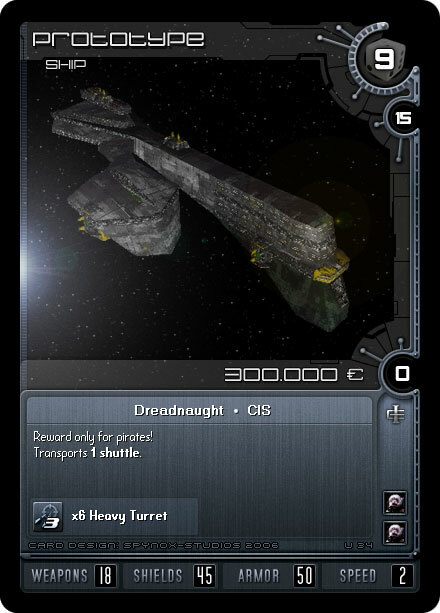 Eleven additional sectors from Armada's sidelines are available too. 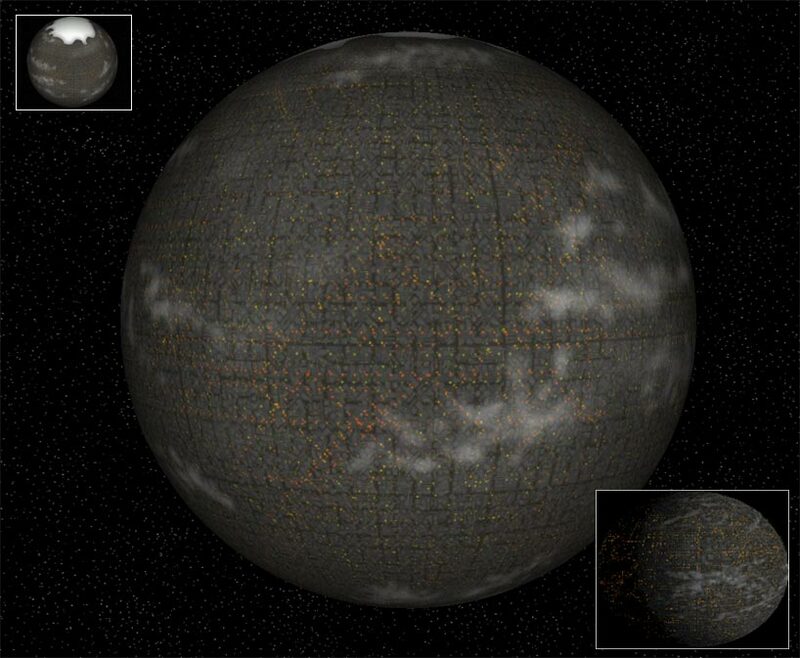 You can also find a ton of different published universe maps. 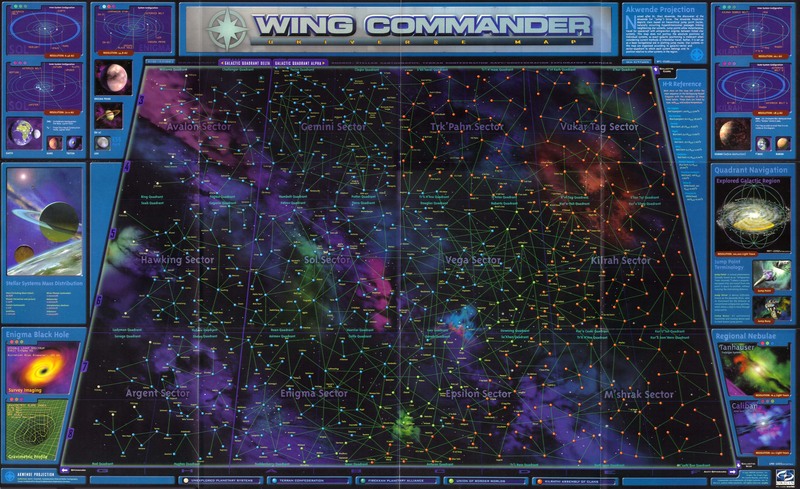 From Prophecy's grand fold-out map to sector drawings included with console ports to star charts in Japanese Wing Commander games, everything you need to get your bearings is available in the Map Archive.